There are some holidays you kind of forget and some that stay with you a lifetime! 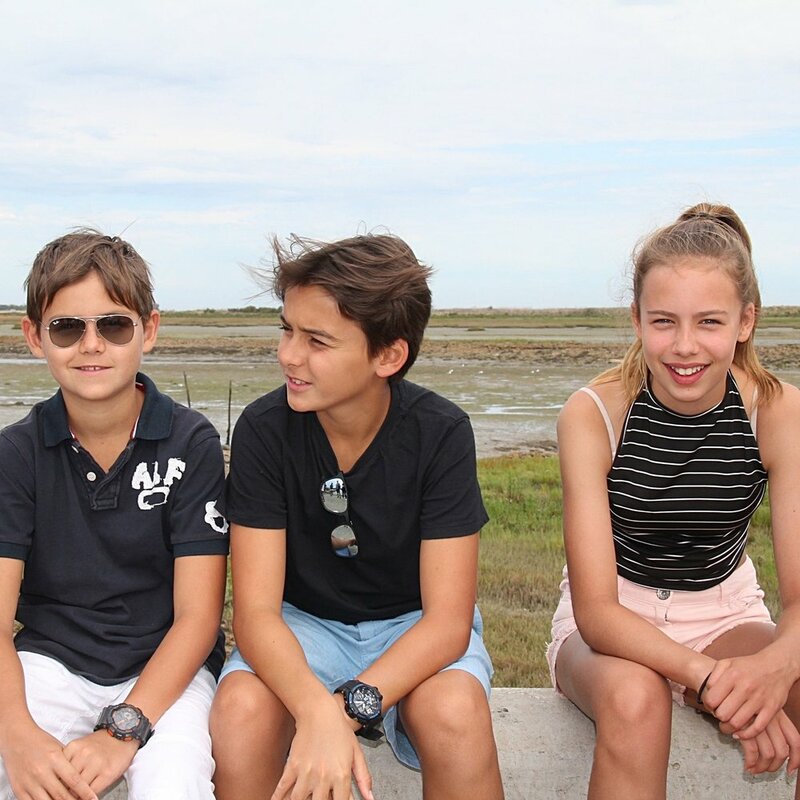 A very good friend and I decided we would meet somewhere in France for a weeks holiday with our teens last summer. 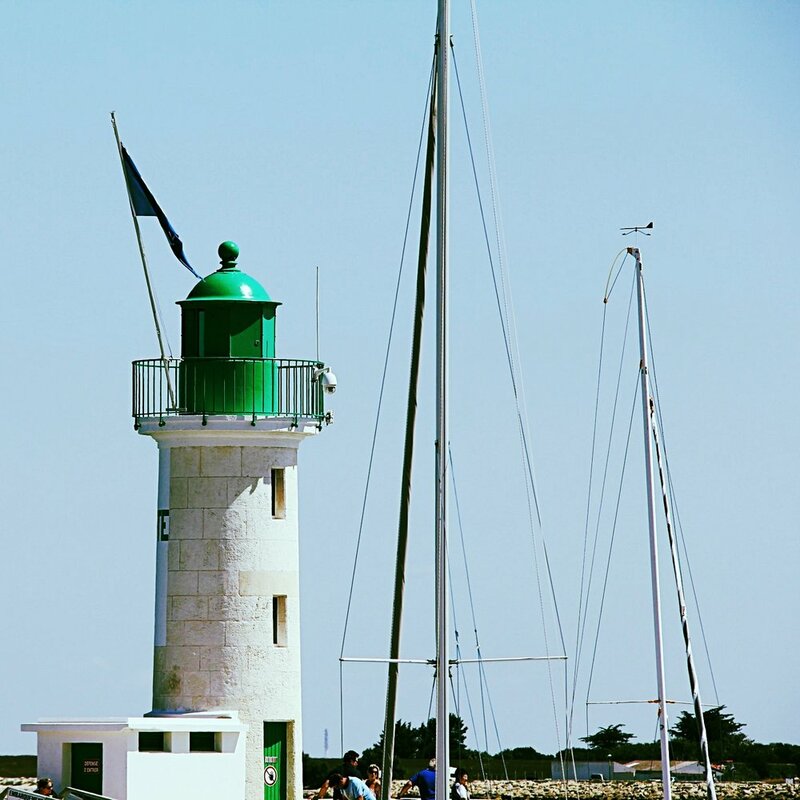 Ré, as the locals call it, is a tiny, long island just off the Atlantic coast, only a bridge drive away from La Rochelle, France. I have to mention that it was the end of the summer (last week in August) and reserach told us July is very crowded. The population jumps from 20'000 local residents to 200'000 during the peak months! However, we didn't have problems finding empty cycle paths, cobbled streets or beaches! 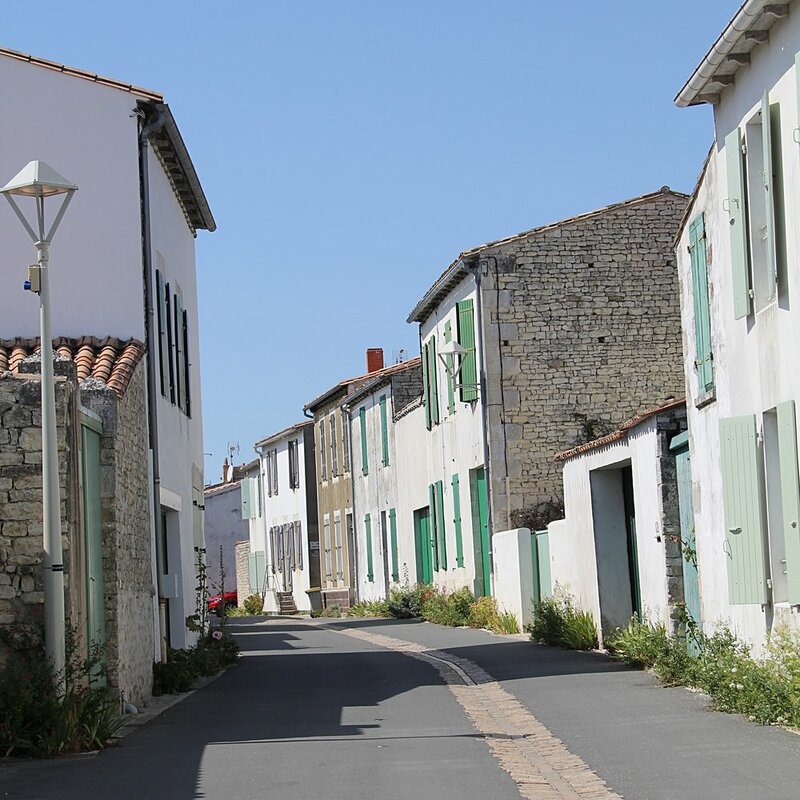 12 villages with beautiful white houses, vast potato fields, lush vineyards, cycle paths, salt marshes and sandy beaches make up this gorgeous island. 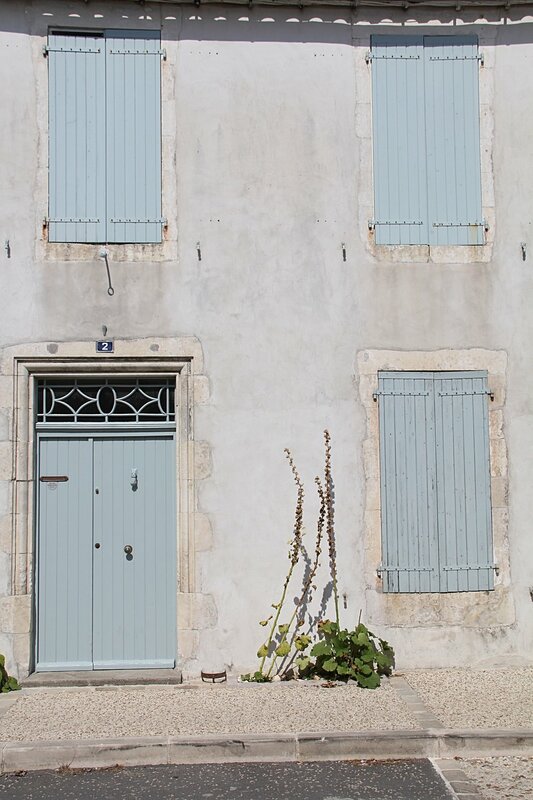 The authentic and simple charm is maintained by the local council who impose restrictive construction rules: no new buildings higher than two stories, no overhead cables, all shutters painted in one of the sixteen shades of blue or green. 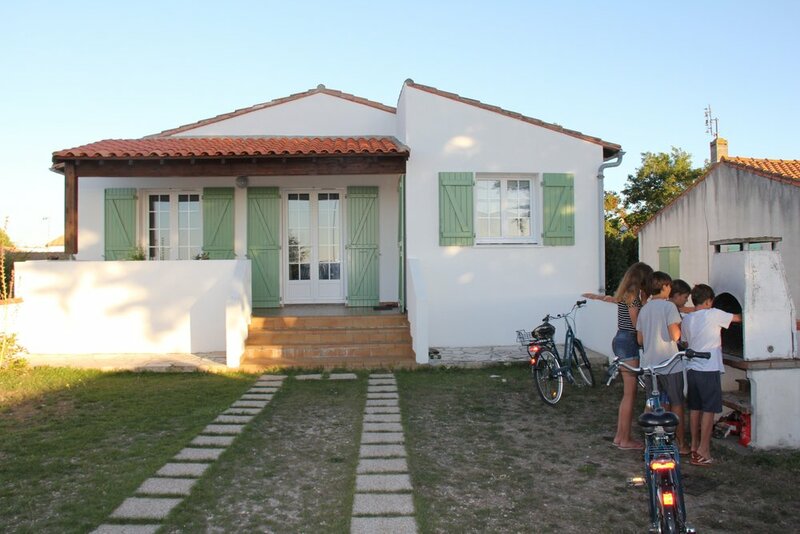 We rented a small house accross the beach, literally. On the first morning, we hired bicycles for everyone and never used the car again! 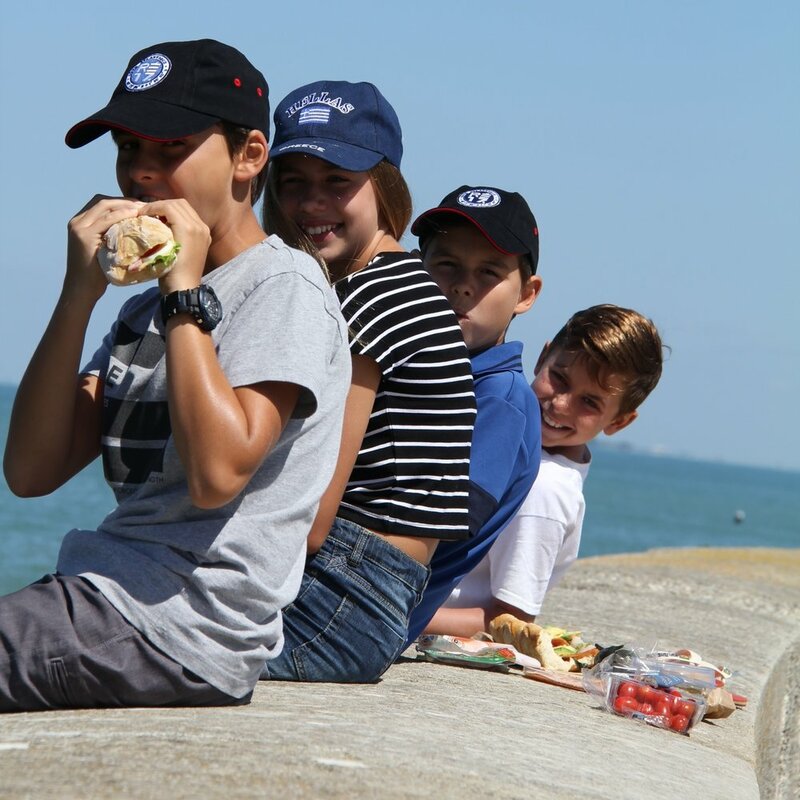 Even when we didn't bbq in our front yard, we cycled along the sea, through a forest to La Flotte, for dinner and ice cream in the evening! 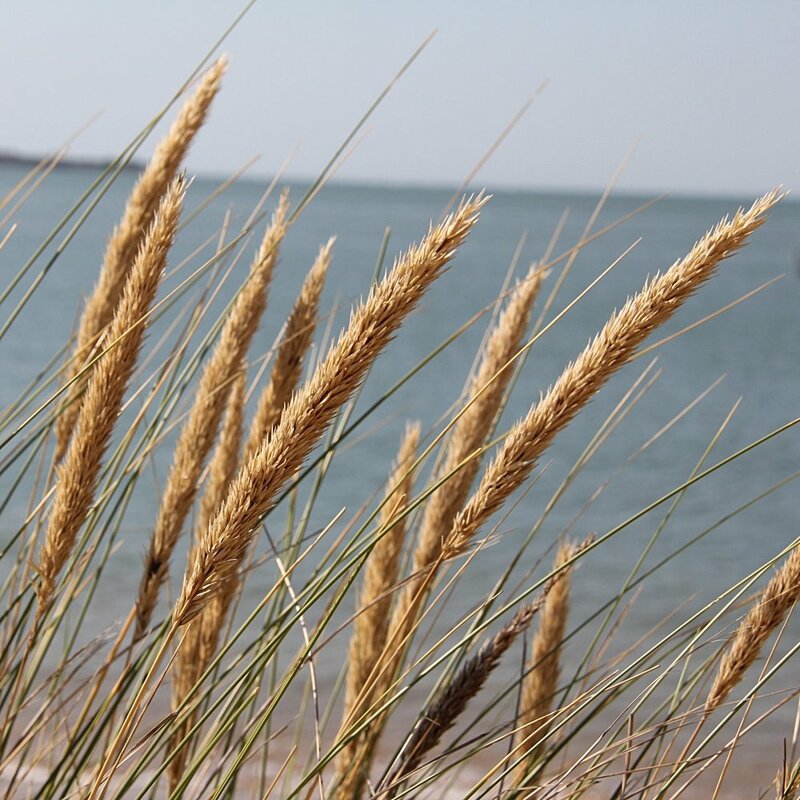 The bay infront of our beach house is what you might call a part-time beach; there’s a lovely expanse of sand, nestled against the inner shore of a small bay, but the tide goes out so far that the sea all but disappears, and the bay seems to revert back to dry land. There are many things to do on the island. With five full days we chose to cycle and explore in the mornings and enrolled the teens in a sailing course in the afternoons. During those lessons, my friend and I contiuned venturing out to different villages by bike, trying to cross off each of the 12 villages. We didn't make it - a reason to go back for sure! 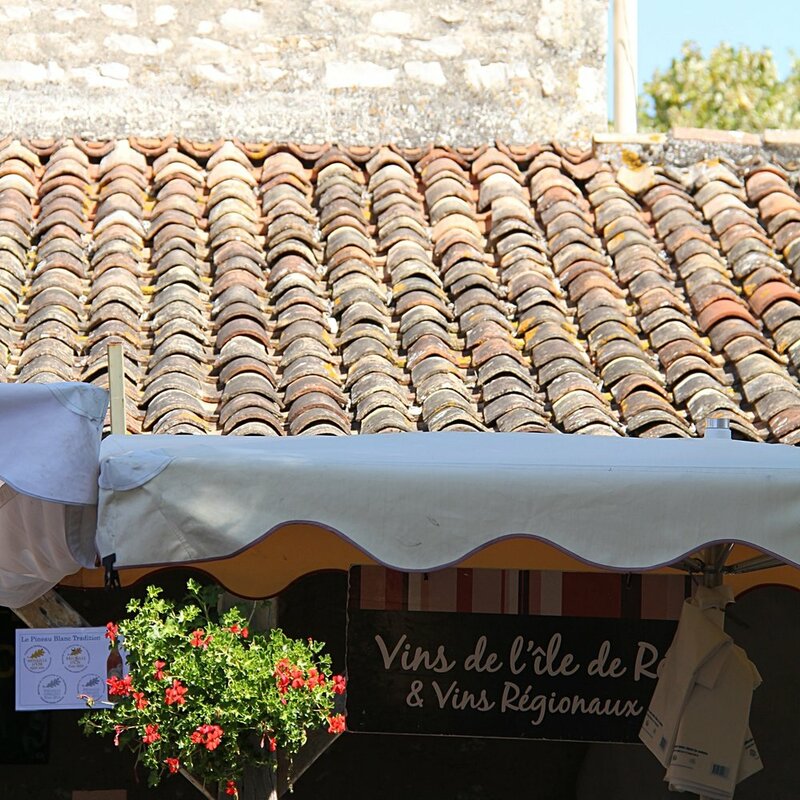 Each village has it's own Farmer's market; whereas most tourists go to Ars, St. Martin or le Bois, my favourites were La Noue and La Flotte. 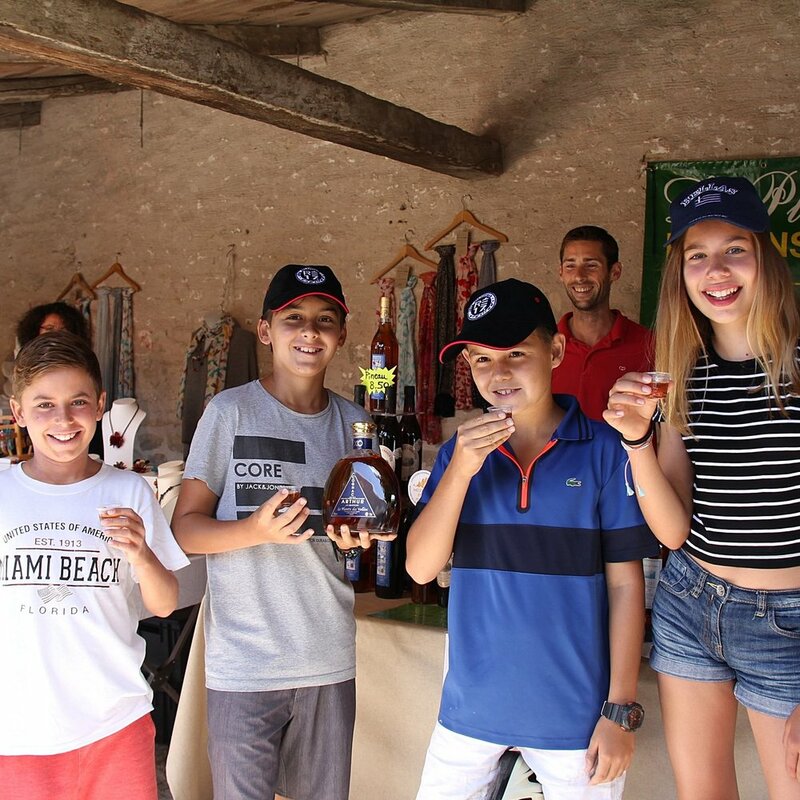 Already on our second visit, the farmers remembered the kids names and helped them choose the juiciest fruit and let them try the local Cognac! 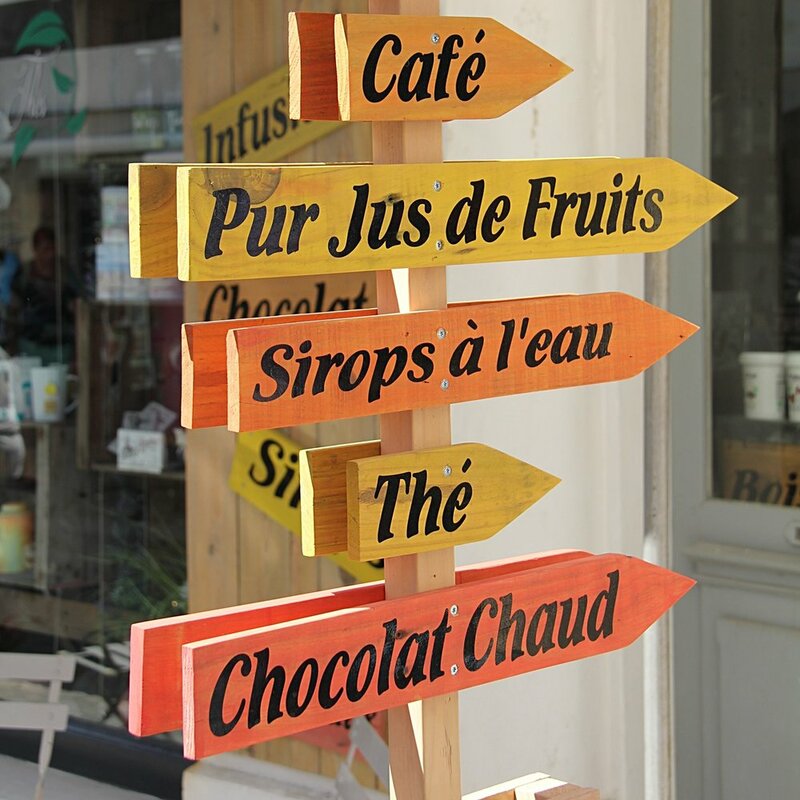 We would pick up some fruit, vegetables and freshly baked baguette for lunch on the go. 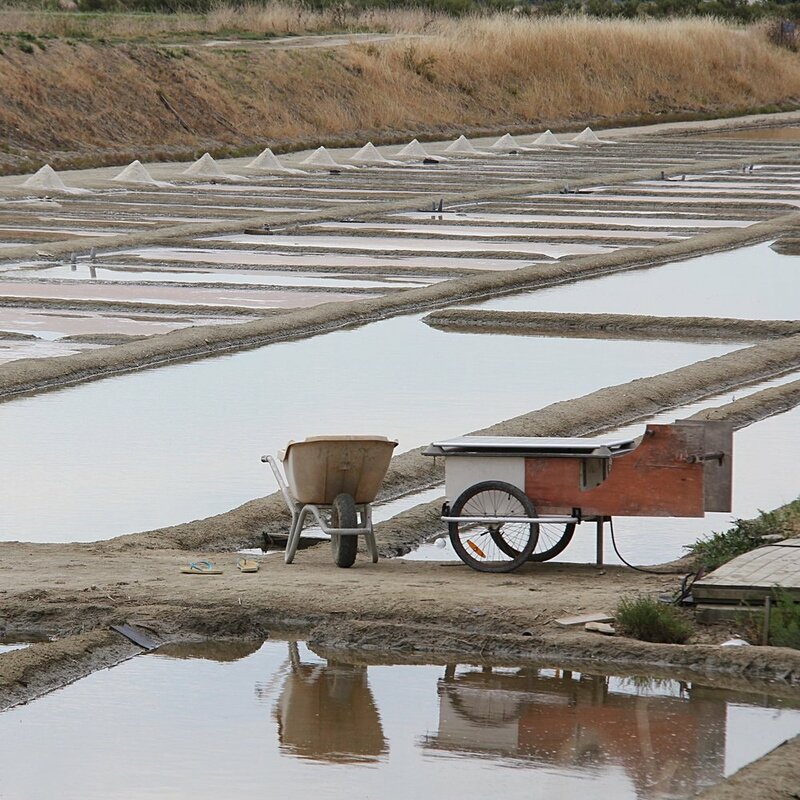 One morning we scheduled a visit to the salt marshes, an incoherent part of the culture. I would recommend it even if it sounds a little touristy. Our guided tour was interesting and I feel it's important to understand as part of the islands heritage. On our last night we found out about the fish locks tour, which I would have loved to have experienced. Again, another reason to go back one day! The locks are coastal constructions in stone, horseshoe-shaped and up to 1km long. They are designed to trap the fish which enter during the rising tide. They then find themselves imprisoned when the tide recedes. In Charente-Maritime, hundreds of locks were built from the Middle Ages, the earliest ones being nearly a thousand years old. 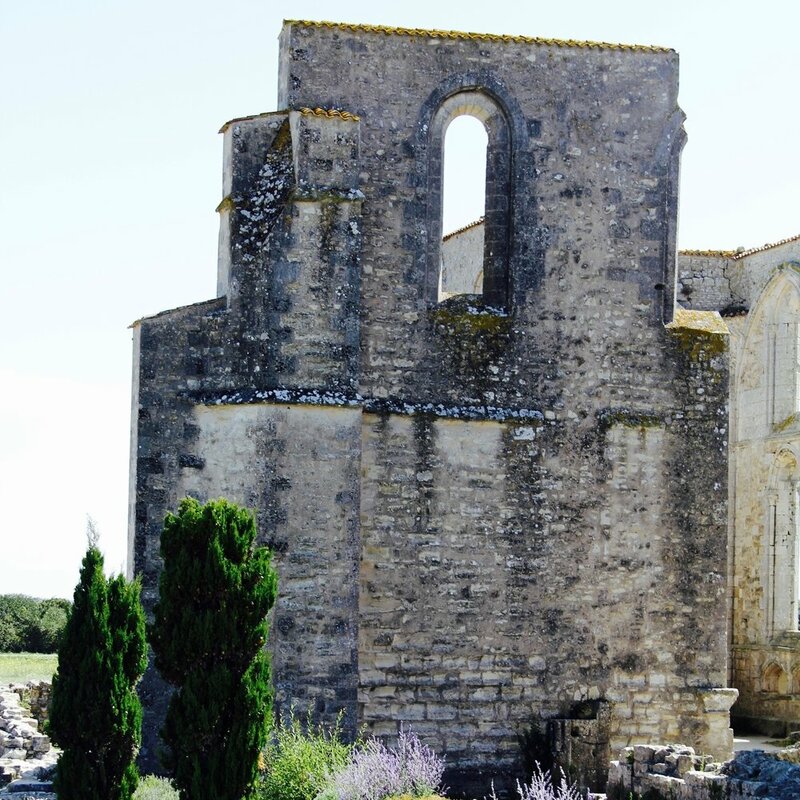 Another morning we discovered the gorgeous Abbaye des Chateliers, ancient ruins worth a stop! 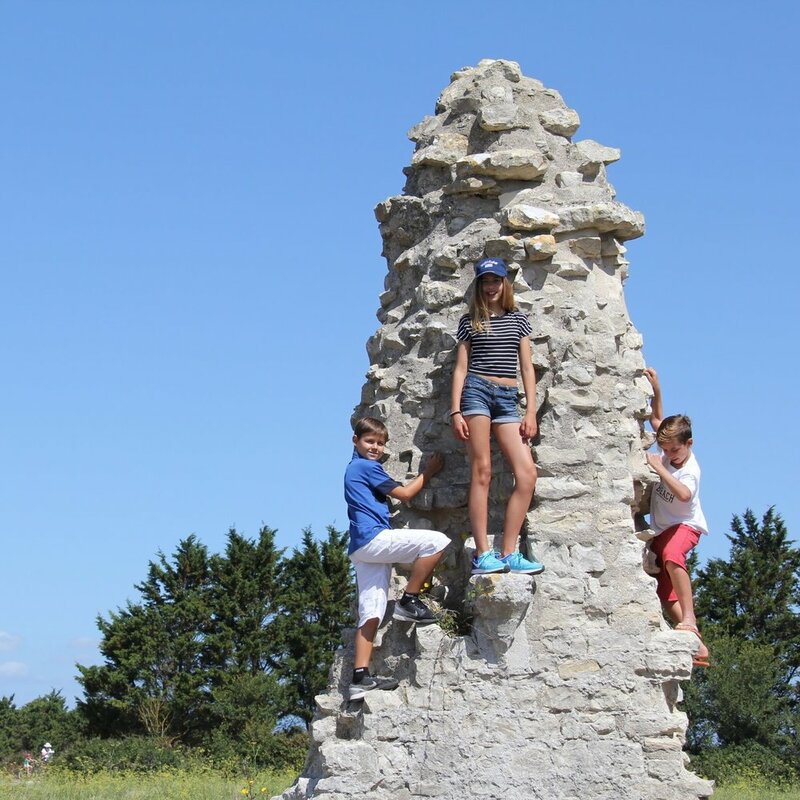 Set in the middle of lush, green fields, these ruins were a highlight to see and of course the kids couldn't help themselves. 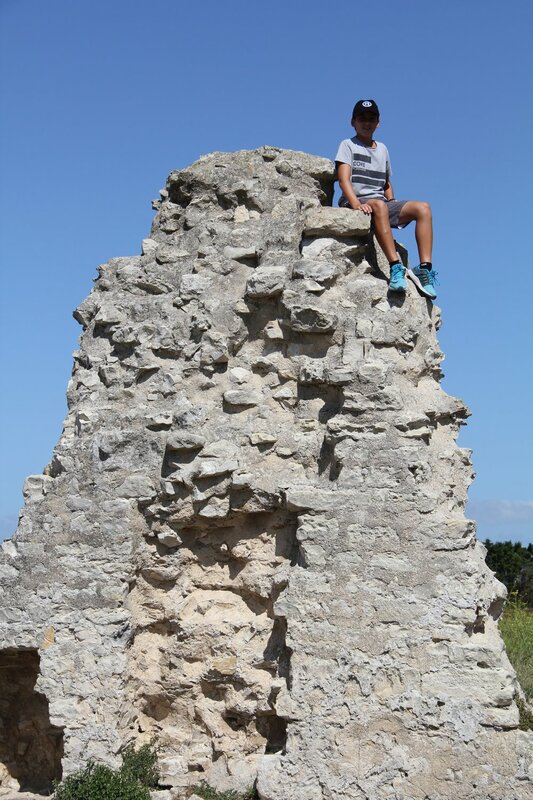 Give teens a rock and they will climb it! 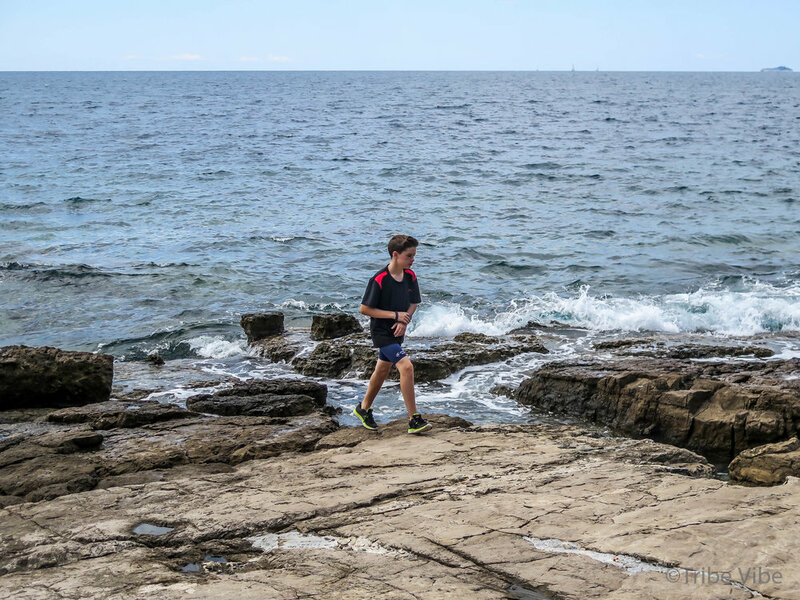 My favourite part of the holiday were the long runs and walks with my friend, chatting, making up for several years of long distance friendship and seeing the kids so independant, safe and happy in simple yet stunning nature. 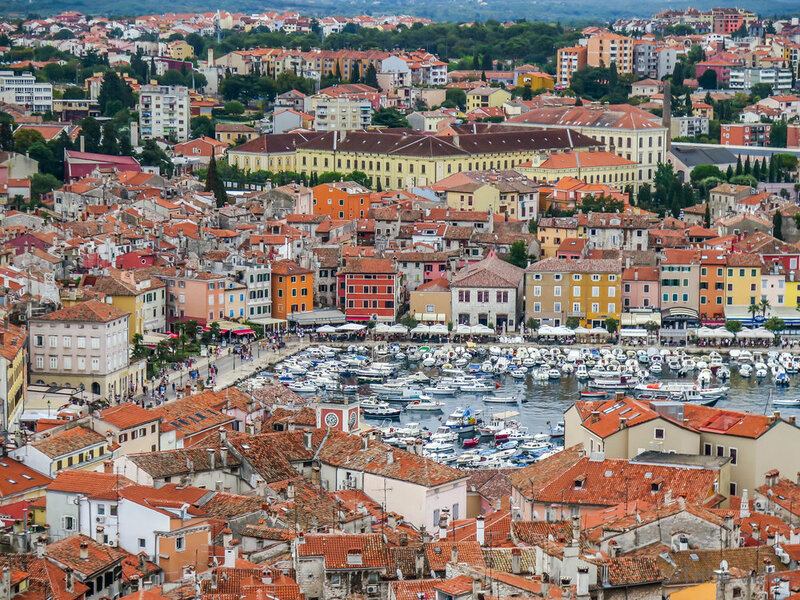 If you are looking for a fabulous European vacation, Croatia should be on your list. It's perfect for all ages (we traveled with grandparents, parents, young children, tweens, and teens on our trip.) There was something for everyone! Below is a list of beautiful stops to make and inspiring eye candy photos. 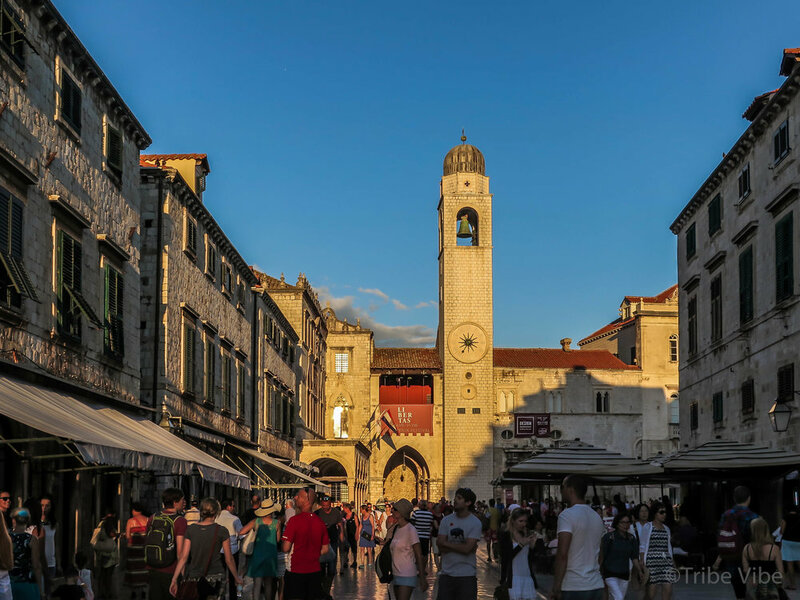 Click on the titles to be directed to our posts on Rovinj, Split, Mlini, Dubrovnik, Lokrum Island, Croatian Vineyards, and Plitvice Lakes. Go, you will love it! Traditions and culture give character to a place. Personally, delving into the history, food and customs is the most fascinating aspect of travel; even if it's returning to my home country with my two boys for a weeks skiing. Raising the boys abroad means they miss out on many Swiss traditions throughout the year. 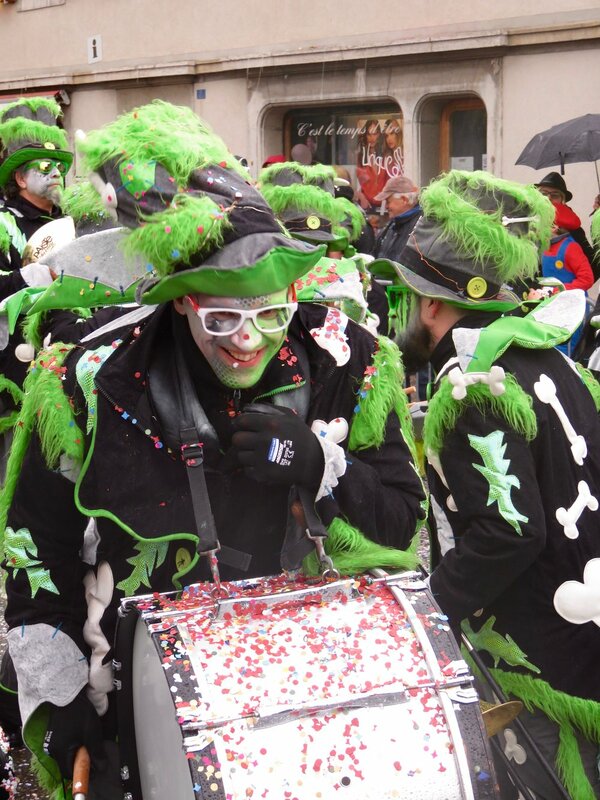 In February, the biggest celebration in the Kanton of Fribourg is the Carnaval de Broc. 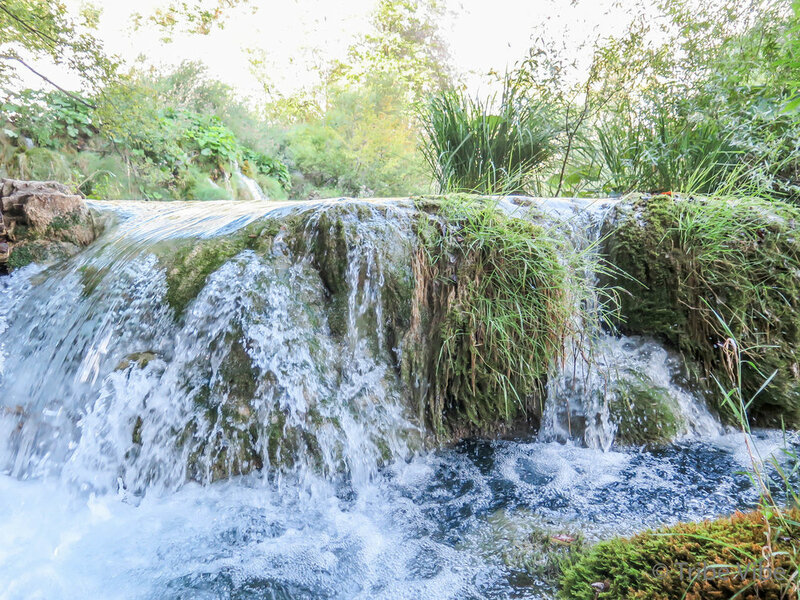 Our last stop on our Croatian journey was to Plitvice Lakes National Park. 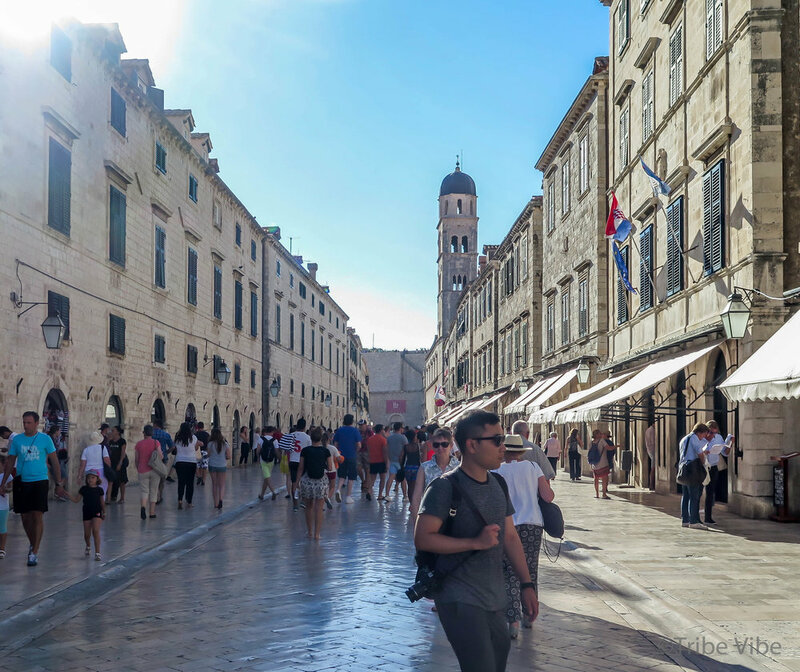 For this last leg of the journey, we left Dubrovnik and headed straight back up the Dalmatian coast until Zadar at which point we heading inland to the Park. The whole journey took the bulk of the day to complete. As the organizer of this trip, I'm pretty sure our team members were questioning whether our one day at the park was going to be worth all the time in the car. I can confidently say, "it was!" When booking accommodations online, for a group, on somewhat of a budget, you never know what you are really going to get. For Plitvice Lakes, we were more than happy with our selection of apartment/hotel. It was located in the greenest of settings, a short drive from the entrance to the park. 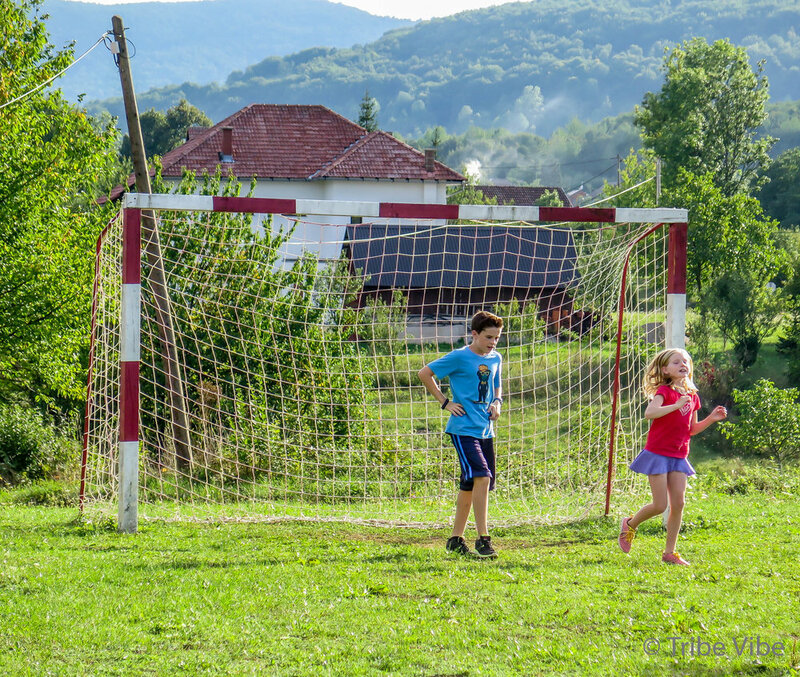 With one step out of the car, the kids were instantly transformed from cranksters to happy, rambunctious kids, noisily running around kicking a deflated soccer ball. I only recommend places we have stayed if they really checked all the boxes for our family- ease of check in, decent sleeping arrangement (for a family of 5 this is not easy), good price, nice people, great setting, and good food. This totally checked all the boxes. 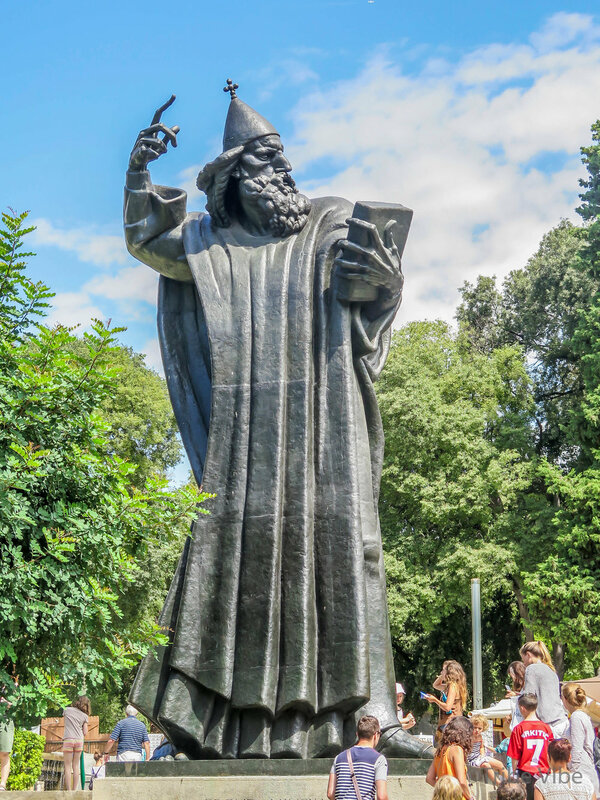 So here you go, if heading to Plitvice Lakes National Park, I recommend you drop House Tina a line. After the kids burned off a day of built up energy it was time to eat. There wasn't much in the close vicinity in ways of restaurants so we opted to have a BBQ dinner prepared by our hosts at House Tina. What a smart decision that was! It was so good that we did it again the next night. 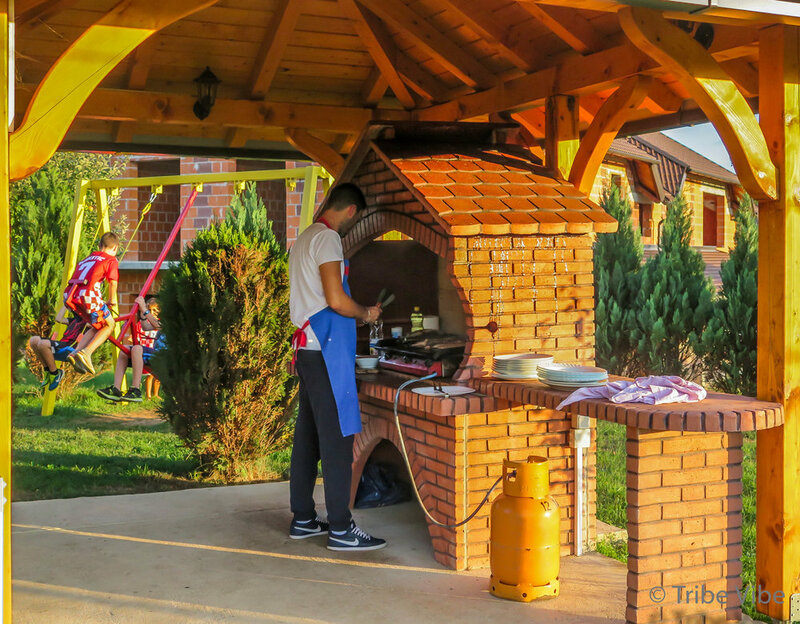 The owner's son prepared a huge BBQ dinner with yummy salads all presented al fresco. To top it all off we had a sweeping view of the lush countryside. The kids ate, ran around, and then returned to eat some more, while the parents and grandparents relaxed with good wine, good food, and a great view. A perfect summer night family dinner. 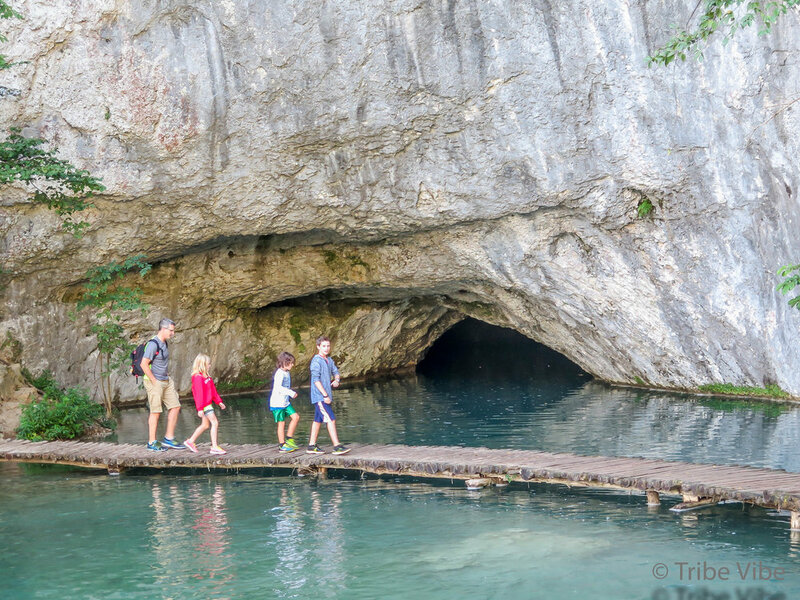 We were warned that tour bus upon tour bus shows up to visit Plitvice Lakes National Park so the early you can arrive the better. Dreading the thought of hoards of people, we made sure we were first in line at the entrance the next morning. Being from Canada, Niagra Falls is what comes to mind when you speak about waterfalls. 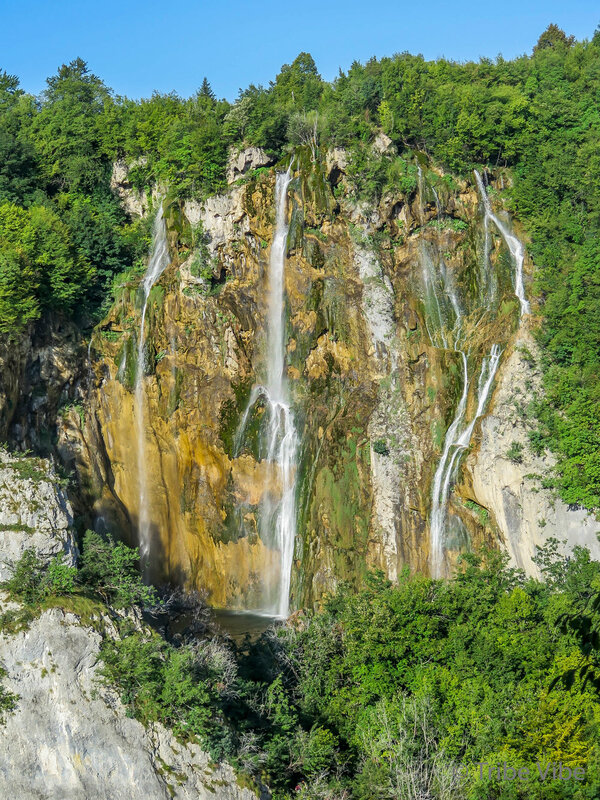 This needed to be erased from our minds as the waterfalls at Plitvice Lakes were nothing like this. 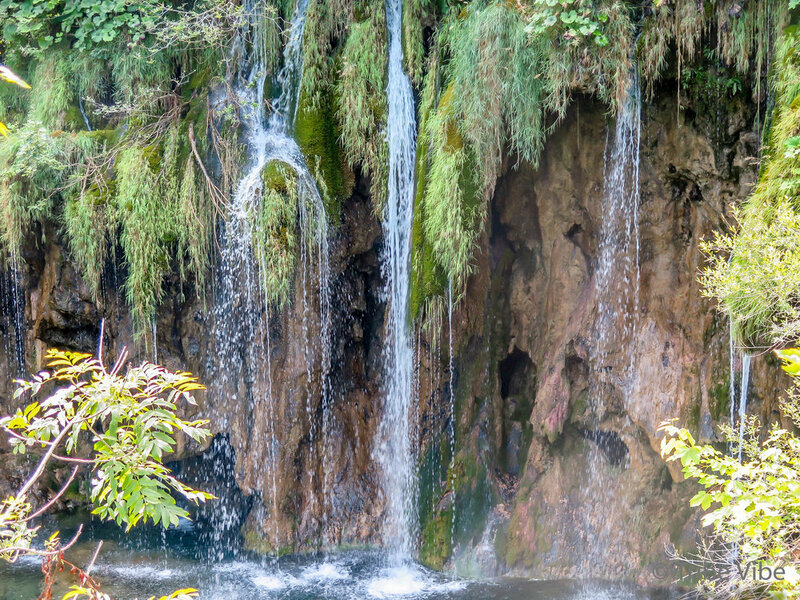 Instead of one massive forceful waterfall, you will find dozens upon dozens of beautiful flowing falls. some big, some small, some with force, and some just trickling. Lush green trees gave shelter from the sun and helped keep the air cool. 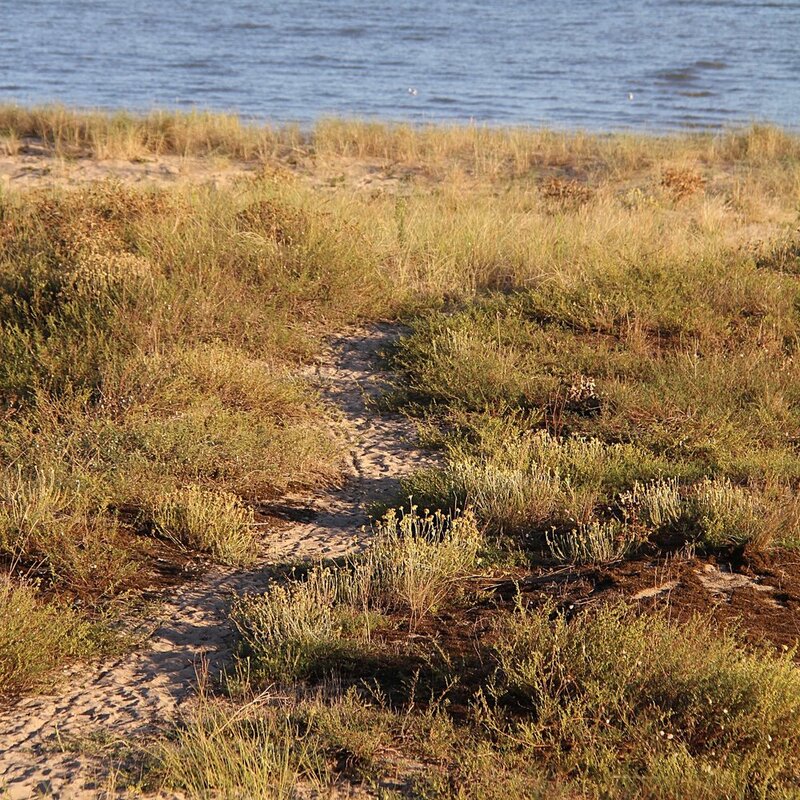 At times the path was shown by carefully groomed boardwalks while at other times the path was just mother nature's dirt floor. There were trees to climb, water to cross, fish to watch and waterfall after waterfall to gaze at. It was spectacular. At one point along the trail, you will reach the lake. Here you can take a few minutes to relax while you are chauffeured across in an open ferry. The water is so clear throughout the park that it almost didn't seem real. While in the ferry, really take a moment to take in just how clean this water is. Incredible. The bulk of our day was taken up walking the park and at the end, we still wished we could do more. I'm happy to report that we did beat the crowds for the most part- victory! Be warned, we heard over and over again that waiting until later in the morning to arrive is a disaster. you are pretty much guaranteed to be walking shoulder to shoulder with your fellow tourist (at least in the summer months.) So make the most of it and arrive as soon as it opens (even 10 minutes before :-) And bring plenty of water and snacks as there is no opportunity to buy them on the trails. We wrapped our day up at the park around 3pm and decided to try and squeeze one more activity in before heading back to our apartment for the evening. 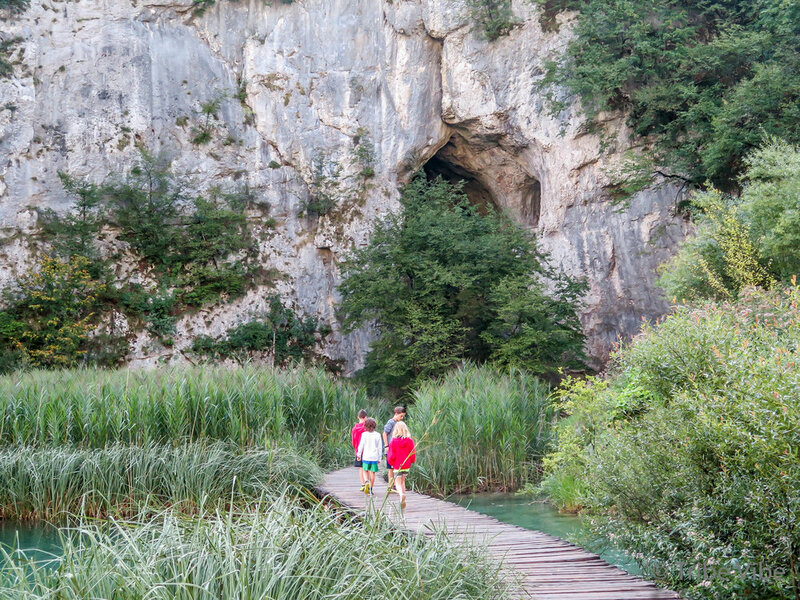 The night before we had stopped at the tourist info and they had recommended that Barac Caves could be worth a stop. So we piled into our cars and headed to the caves. The guided tour of the caves took about an hour from start to finish so you don't have to commit too much time here. The cave formations were really interesting and it felt so nice to be out of the heat of the day. Be warned though, once again there are places in the caves where people with a fear of heights might not have much fun. 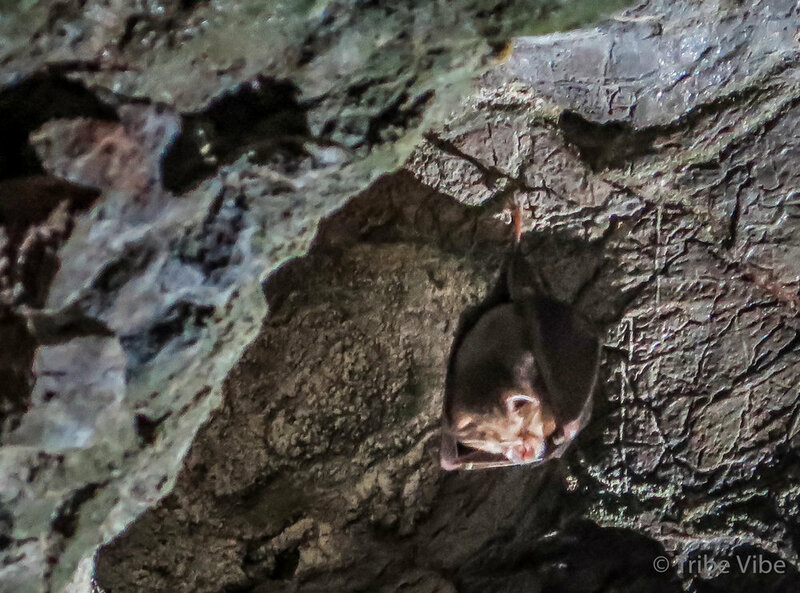 The highlight came as we were exiting the cave and looked up to see a few upside down bats. What kid wouldn't get a thrill from that? All in all, the caves were a good pitstop but definitely not something you will be devastated by if you don't have time for a visit. The next morning we were up early and headed back to Venice to catch our flights for each of our home destinations. The Croatia we saw was beyond our expectations. If you asked me if it should be on your European dream list I would answer without hesitation "ABSOLUTELY." When I asked the kids what they thought of the trip, they responded with a loud "we loved it!" So there you have it, a trip for everyone. Next time we return we will be heading to the famous Croatian Islands. Until then, I continue to dream of adventures. 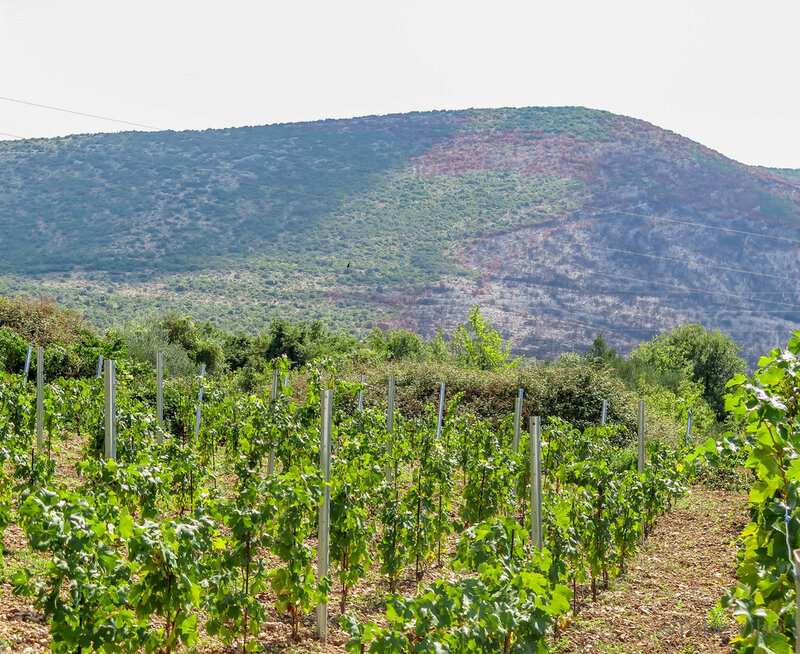 After exploring Dubrovnik at length we decided we would take a day trip and check out a few vineyards we had been hearing so much about. Traveling with a family of wine drinkers, this was a welcomed suggestion. We hired a small coach to take the eleven of us to two vineyards and to visit the towns of Ston and Mali Ston. First stop was the medieval town of Ston. Ston and Mali Ston are small towns that sit on the Peljesac peninsula about an hour and a half from Dubrovnik. The two towns are famous for their encompassing stone walls that were built to protect the cities. 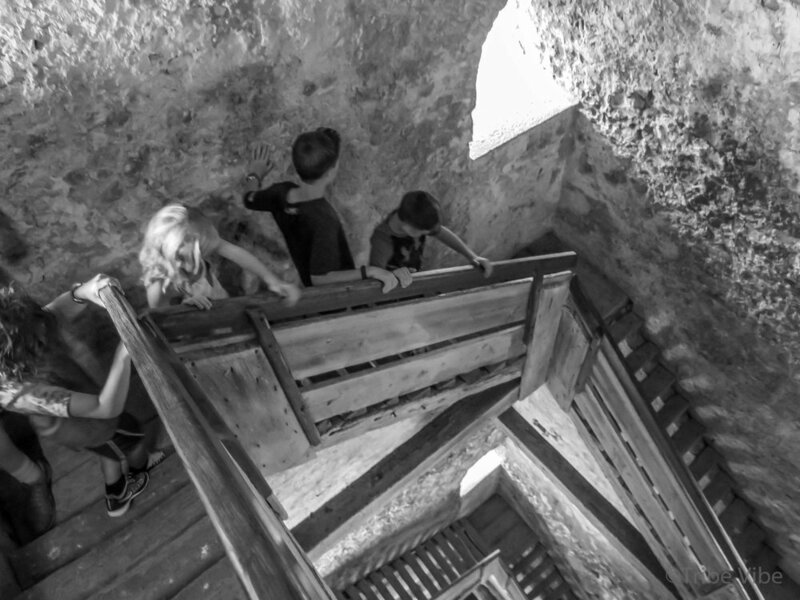 The walls are still very much intact and you are able to walk them. We, however, did not opt to stroll on top of the walls and just remained in the town centre. This might be part of the reason that Ston didn't leave a huge impression on me. It was nice, very nice, but after towns like Dubrovnik, Split, and Rovinj, this just wasn't quite the same. I think however that maybe a walk upon the walls might have increased my enthusiasm. However with 5 children in tow, we weighed the entrance price for the tickets, the high heat of the day, and the potential for child/parent meltdowns, and the team decision was to stay at ground level. Did we make a mistake? 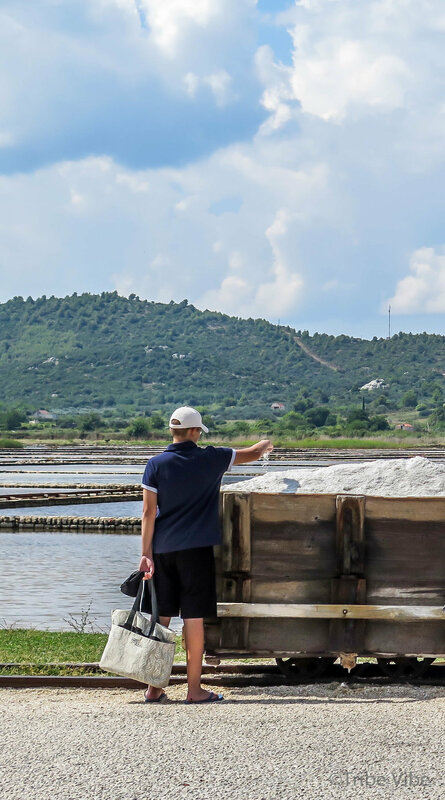 Ston is also home to a large industry of salt production. 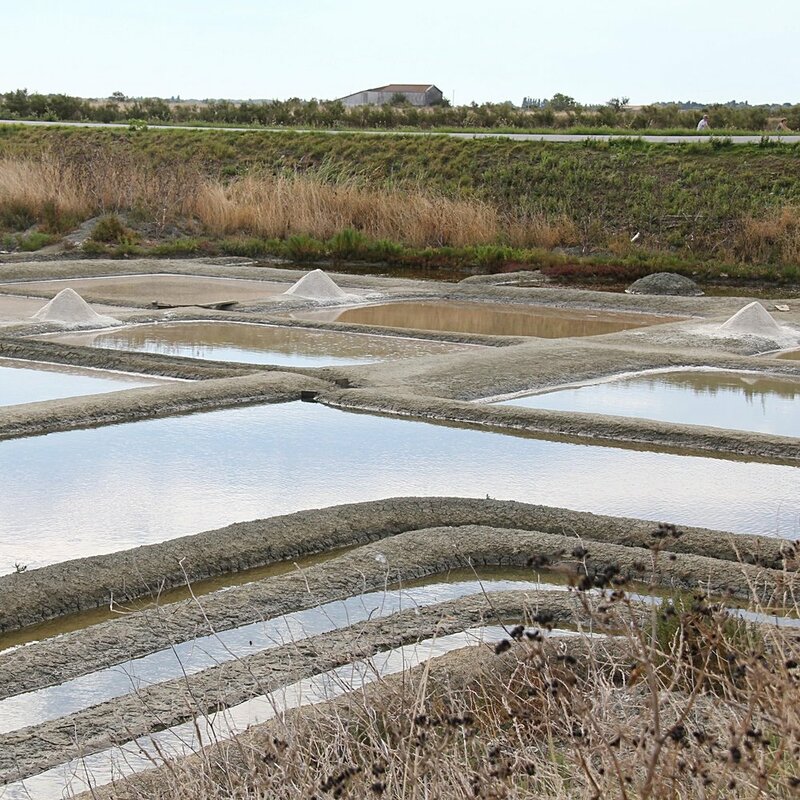 It is said to be among the oldest salt producers in the Mediterranean. 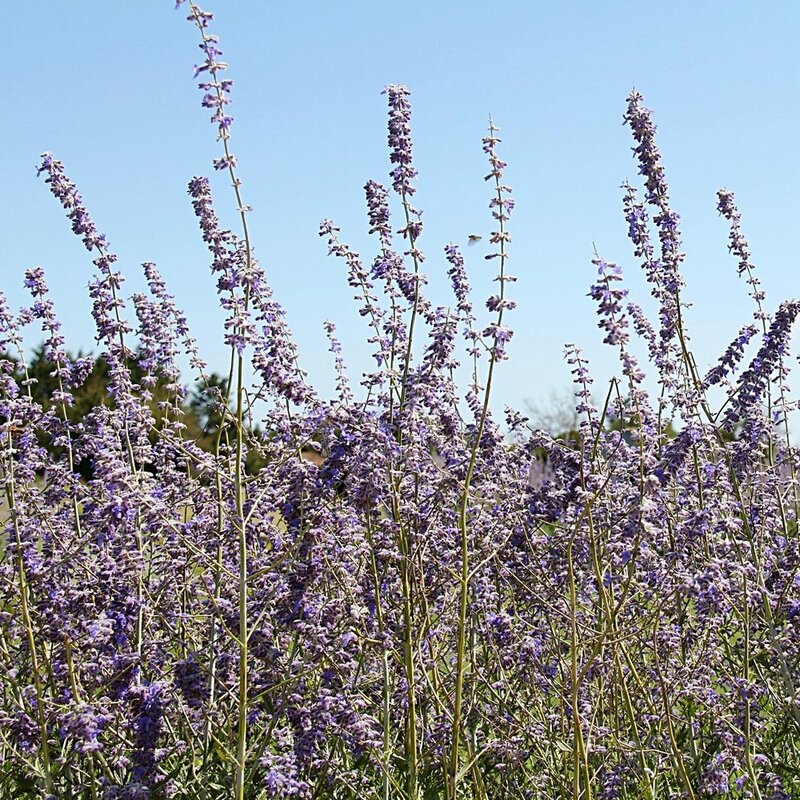 It is still harvested by the same method as nearly 4000 years ago. 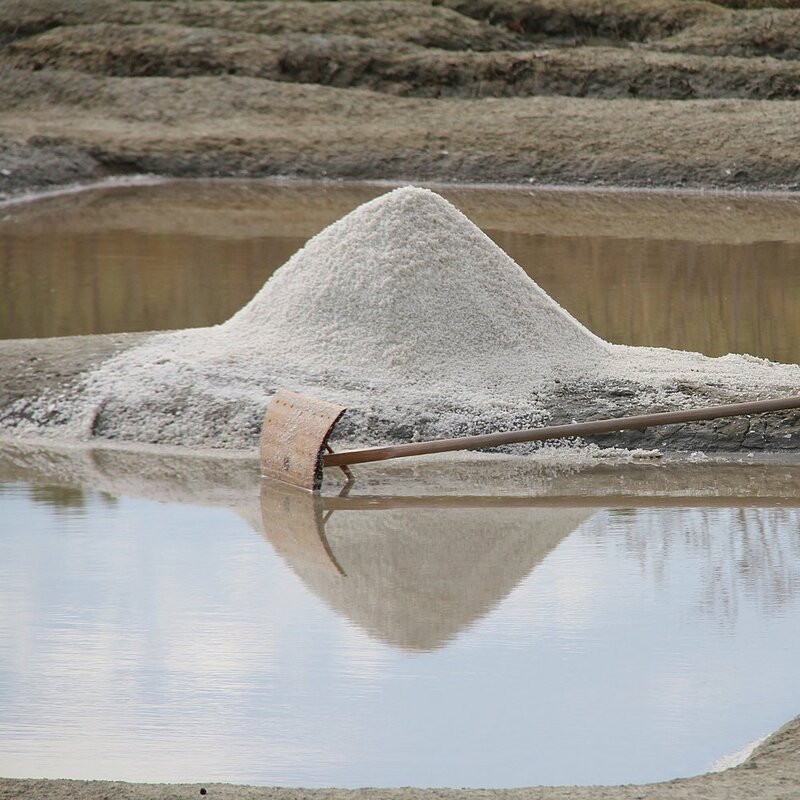 Seawater is left in pans to evaporate and then the remaining salt is shoveled into carts and brought to basins for production. 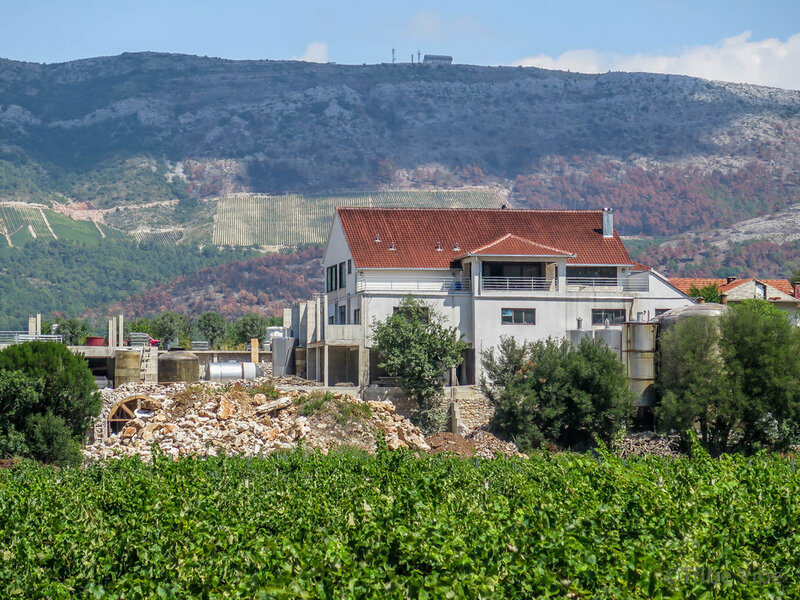 From Ston, we headed up to the vineyards. And when I say up, I mean up. If gaining altitude wasn't bad enough, we were doing it on the edge of a cliff that gave a crystal clear view of the Adriatic 100's of metres below. Before when I was discussing the driving in Dubrovnik and said it would get worse, this is exactly where things got worse. Sitting in the coach, you already feel very elevated but add to this the sheer drop off as you look down to the sea, combined with the absence of any guard rail protection what so ever, equals terrifying. The bus climbed up and up, on narrow often gravel roads, switchback after switchback. The real kicker came when the driver, who knew we were all nervous, decided to take the "back way" home as it would get us down quicker. This was ten times worse than the original way! Even the coolest cucumber in our group was very uncomfortable. So you can imagine the family members who have severe height phobias were having mild heart attacks. No joke, the adults were very grumpy. The kids, however, had their devices and didn't look up once. I wish I could have been them. Thankfully, the drive was not for nothing. The vineyards we visited were fabulous with super nice people giving the tours. 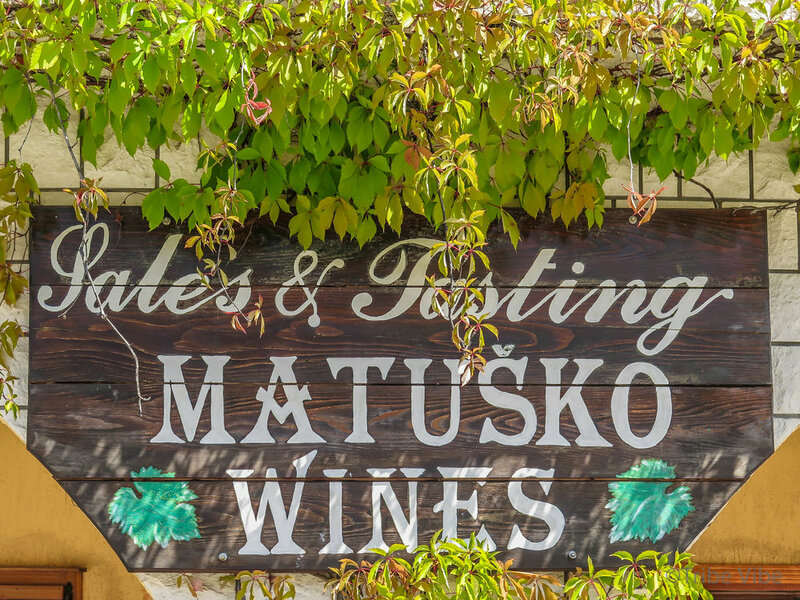 We stopped at two different wineries, Matsuko and Vina Vukas. Both were great. 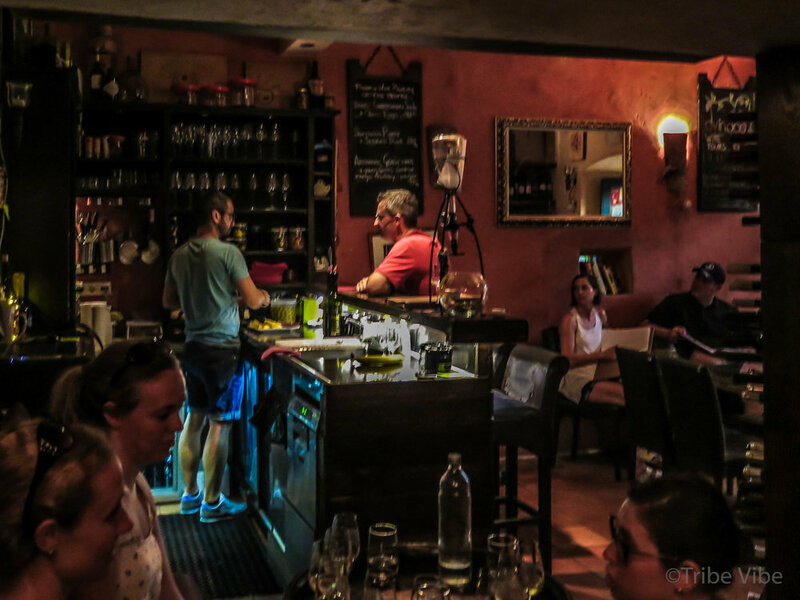 A wine tasting tour doesn't sound like a child's preference for the day but we were pleasantly surprised how much the kids did enjoy themselves. At each tasting there were wine glasses set out for everyone, adults trying the wine and the kids could help themselves to a pitcher of apple juice. 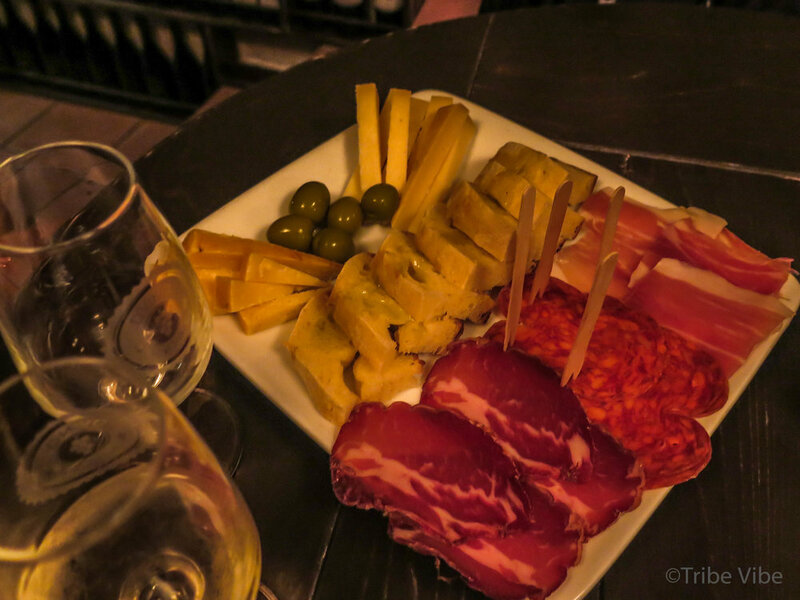 The wine was paired with nice selections of cheeses, biscuits, and sweets. 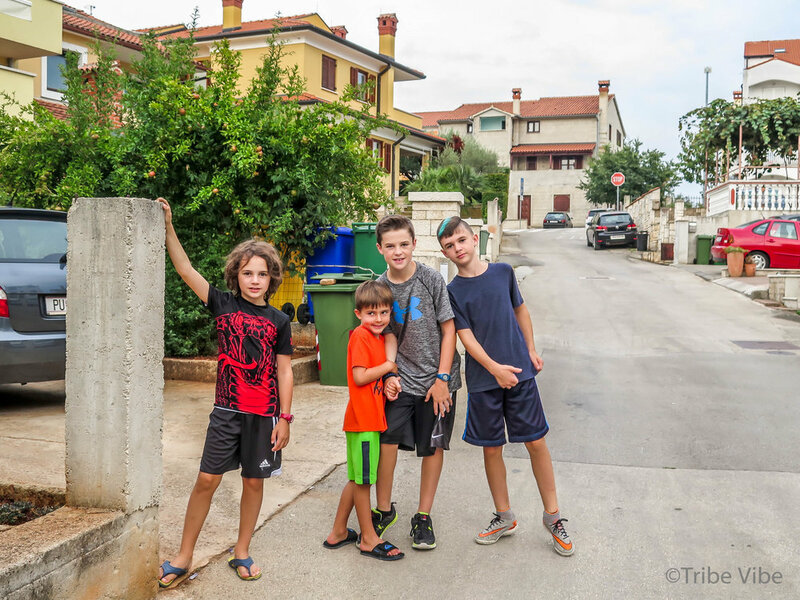 At every stop in Croatia, we noticed how friendly and open the locals were to kids. The vineyards were no exception. 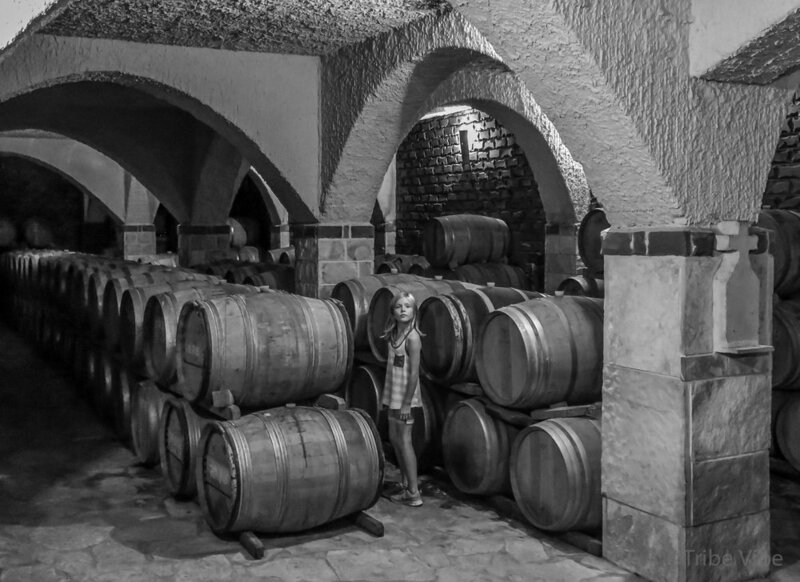 While the adults sipped their wine the children were allowed to freely roam the cellars or go outside and play. There was no stress at all bringing young ones with us. As I am not a wine drinker, I can't personally comment on the degustation, but all the members of our group said the wine was superb. 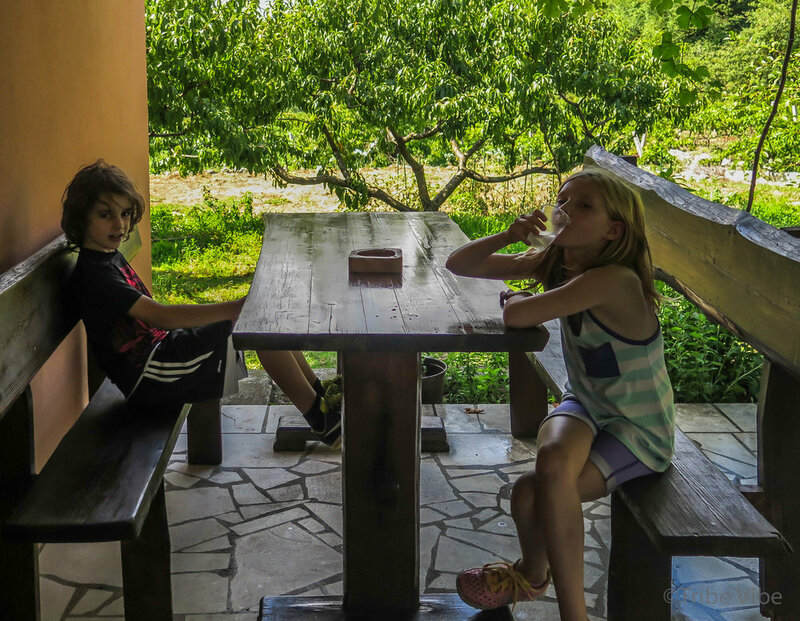 Even the kids enjoyed the Croatian cellars. Once out of the cellar, we were allowed to walk through the rows of vines growing on the properties. Big bunches of hanging grapes were grown to perfection. Through our travels, I have come to realize that every wine country seems to have their own version of a hard liqueur derived from the grapes. In Croatia, it is called rakija. We saw big glass bottles of it fermenting on many balconies throughout our trip. I was told it is similar to a brandy, but I can't guarantee that. 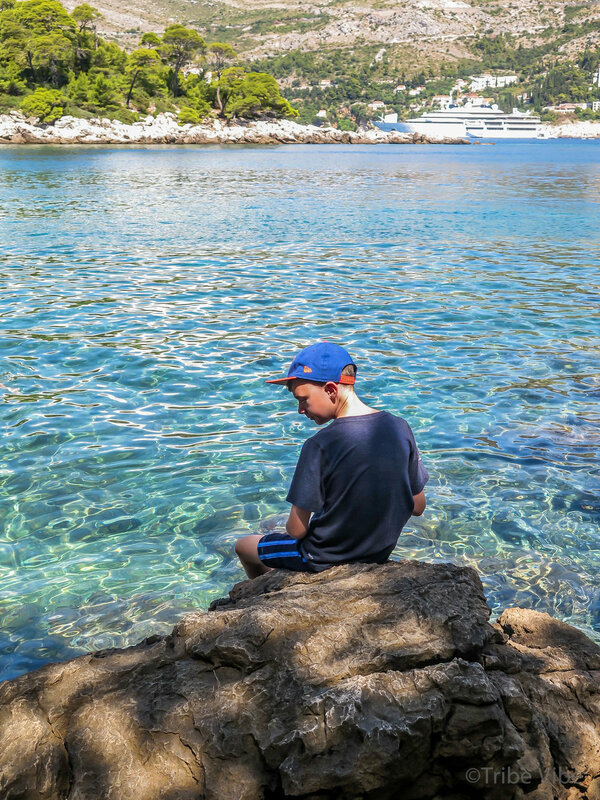 On our second day in Dubrovnik we discovered a real treasure, Lokrum island. 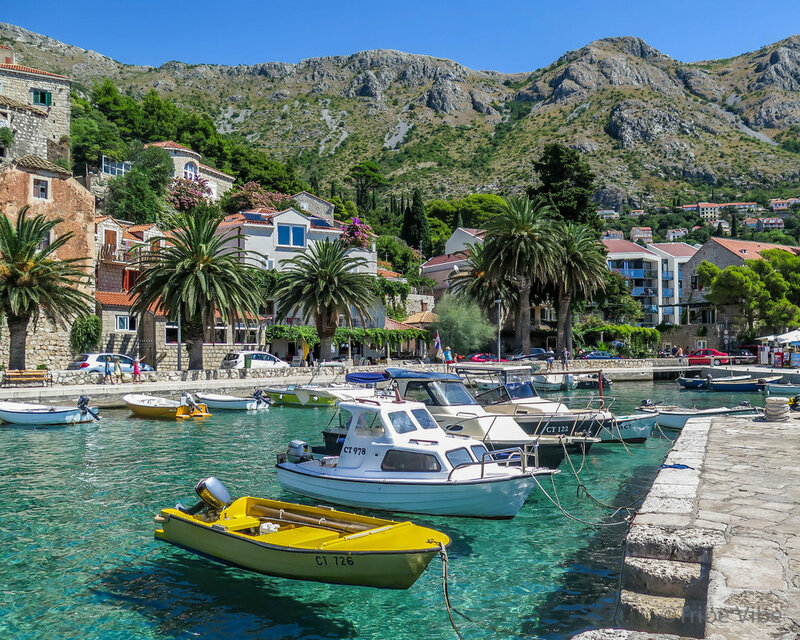 It is about a 15 minute ferry ride from Dubrovnik and about a 30 minute ferry ride from Mlini. Lokrum is a nature reserve surrounded by crystal clear waters and home to many, many peacocks. 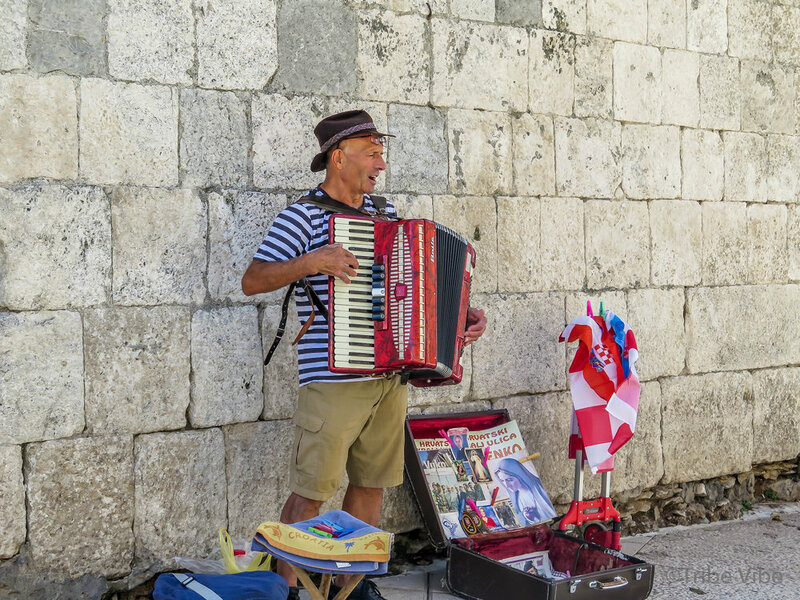 We spent our first morning in Dubrovnik and by midday were hot and tired from all the crowds. Wanting a break from the heat and all the tourists we decided to head for Lokrum. Best decision ever! 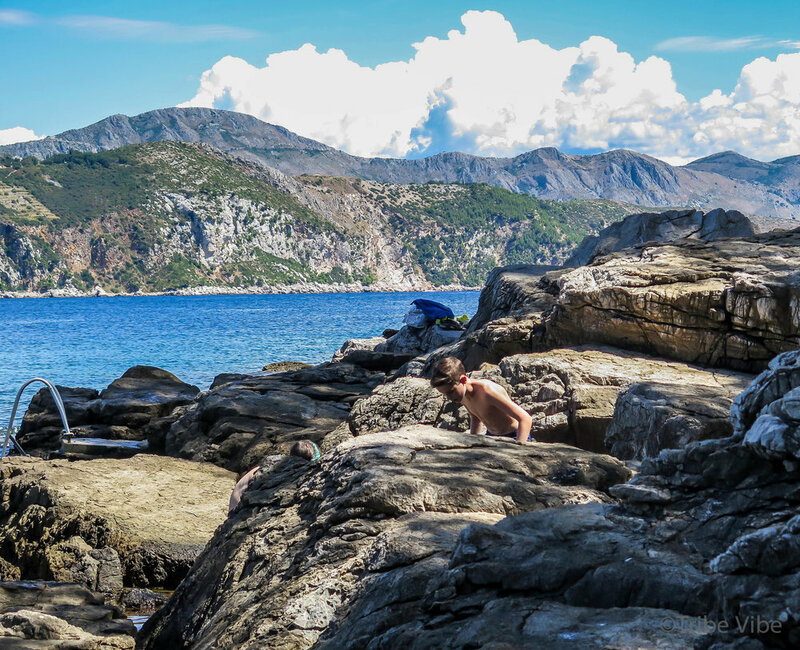 The kids instantly fell in love with the island as there were rocks galore to climb, blue waters for swimming, and nature paths to walk. And not too many people! After cooling off in the water and exploring the first series of rocks, we decided to head to the interior of the island. 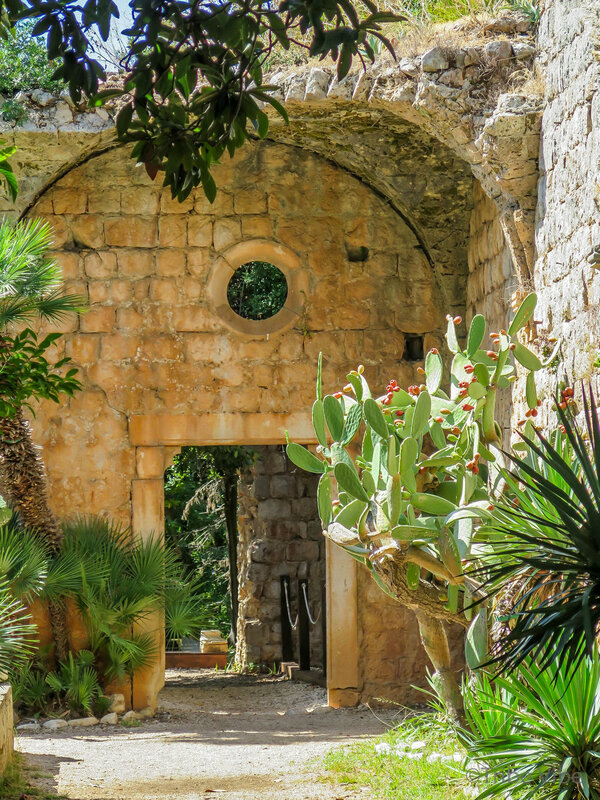 Paths lead you around, passing through beautiful gardens and a maze of olive trees. The boys were especially happy to stumble upon someone's property that just happened to have a basketball net. Score! Since they always travel with a ball close by, the next hour was all theirs to play. While the older boys played hoops, the younger kids ran like crazy amongst all the olive trees. Happy kids all around. On one end of the island, set inland, there is a pool of water called "the dead sea." A small hike down the cliffs takes you to this phenomenon. The water has a much higher quantity of salt compared to the surrounding sea, claiming it is much easier to swim. We didn't really notice a difference in buoyancy but supposedly it exists. After all the swimming and climbing, everyone was getting hungry so we headed to one of the only restaurants on the island. En route we came across lots of wildlife (including more peacocks) and found the ruins of the Benedictine Monastery. By this point, we were all famished. There wasn't a big selection of restaurants to choose from so we pretty much just went for the first one we saw. Another victory- it was fabulous!!! The massive seafood platter was a hit with everyone. 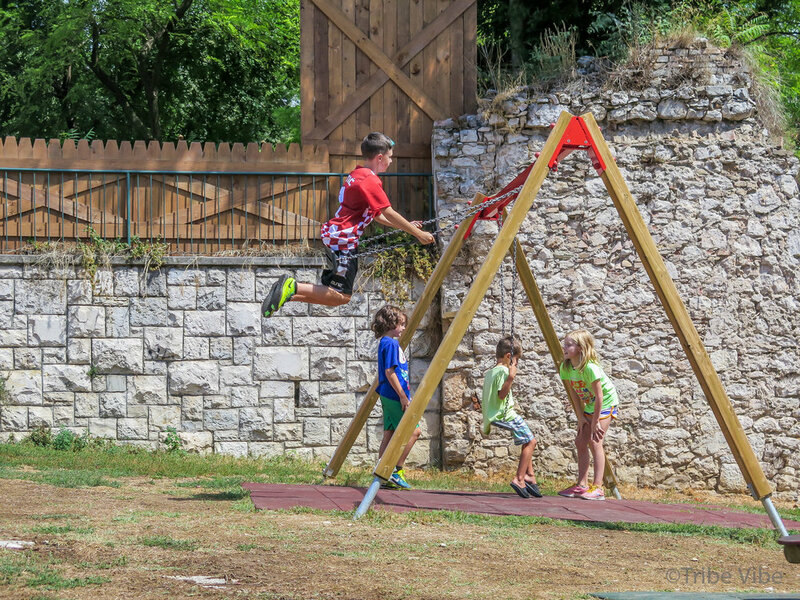 While the adults sat back and relaxed on the restaurant's terrace the kids ran around in the adjacent park. We had time for one more stop on the rocks before it was time to head for the ferry to Mlini. This time we stopped at the opposite end of the island where the water was a bit rougher. The kids were not that interested in swimming but more in building forts. They dragged sticks, rocks, and long grass around trying to construct the perfect hide out. Upon completion, a game of hide and go seek got underway. 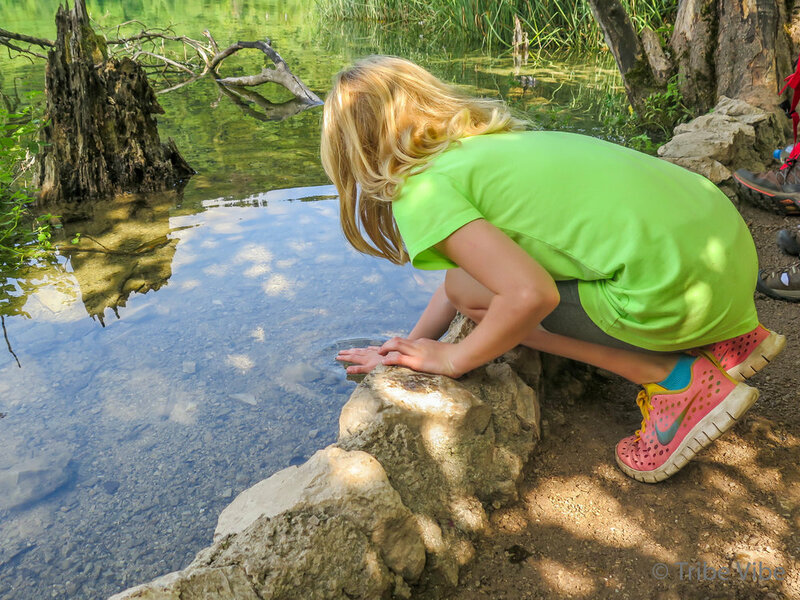 Traveling with our kids usually means finding a balance between their needs and ours. We have found that they can handle the sight seeing tourists attractions for a set amount of time and then things can start to fall apart. Usually, a break in a park and some food is all it takes to reset everyone's mood. 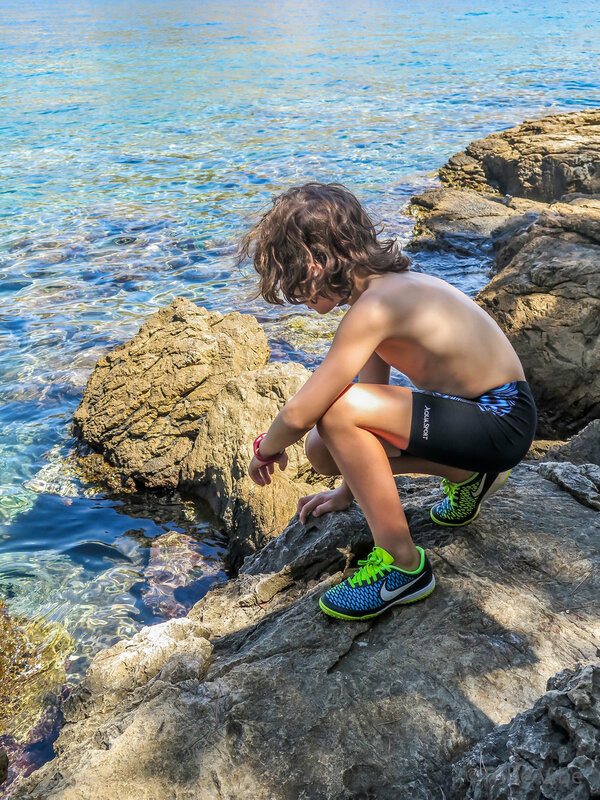 Lokrum island and Dubrovnik were that perfect balance for us. So much so, that we returned two more times. What worked best for us was arriving on the island first thing in the morning and staying until after lunch. 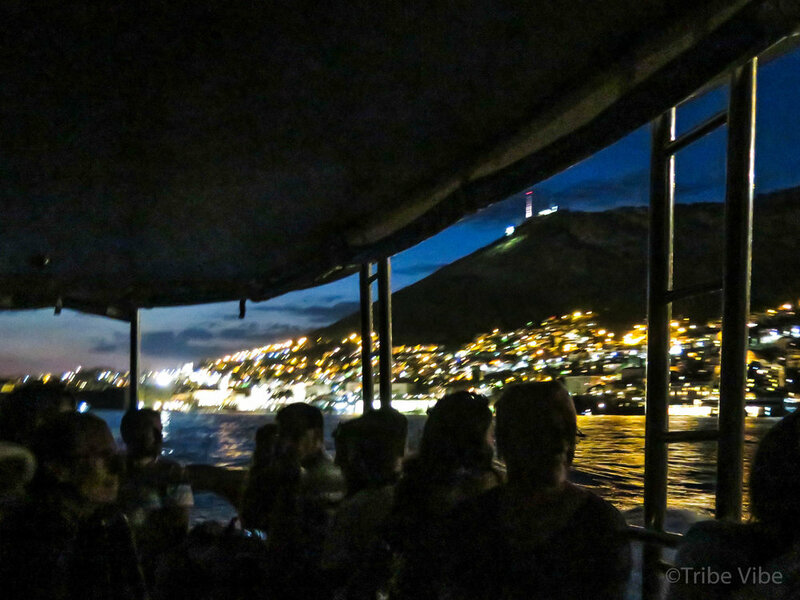 At that point, we took the ferry to Dubrovnik and enjoyed the late afternoon and sunset in the old town. This way we avoided many of the Dubrovnik tourists and also the daytime heat in the city. 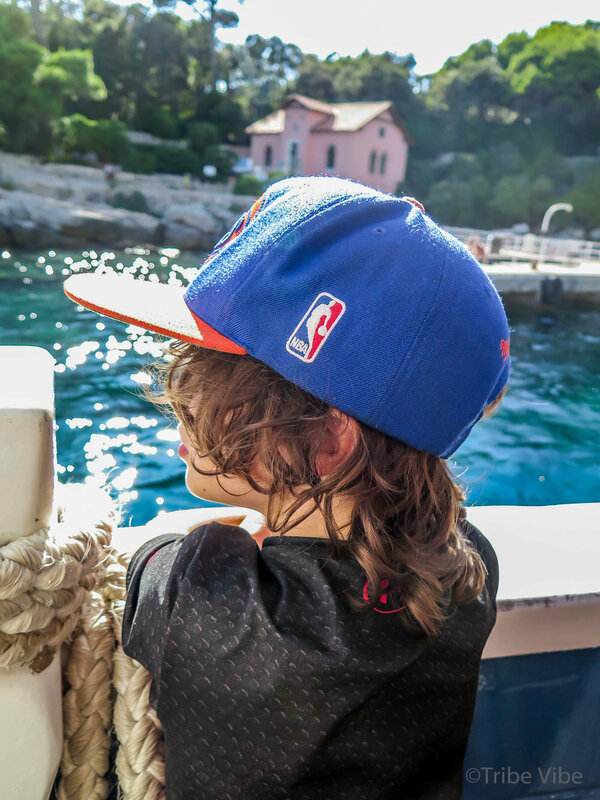 If you have kids (and maybe even if you don't) I think Lokrum is a great stop. 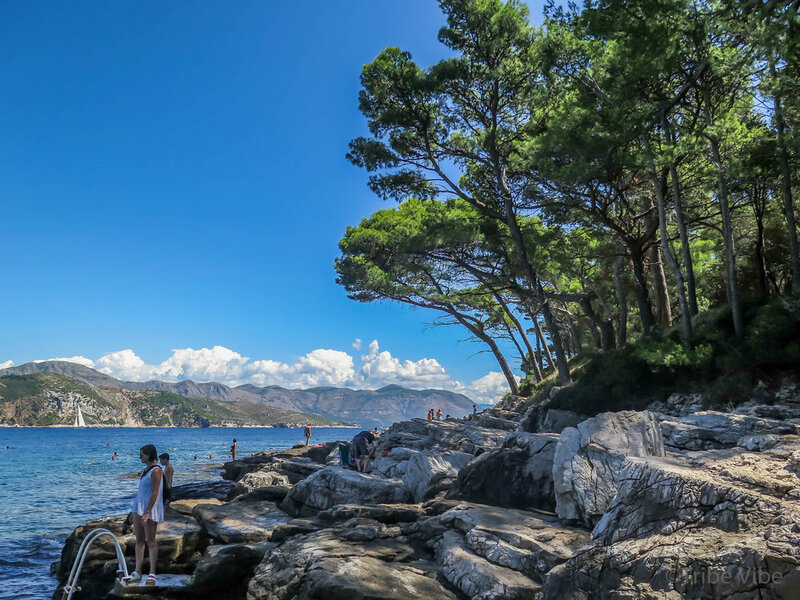 For more information, including ferry schedule, check out this tourism website on Lokrum. 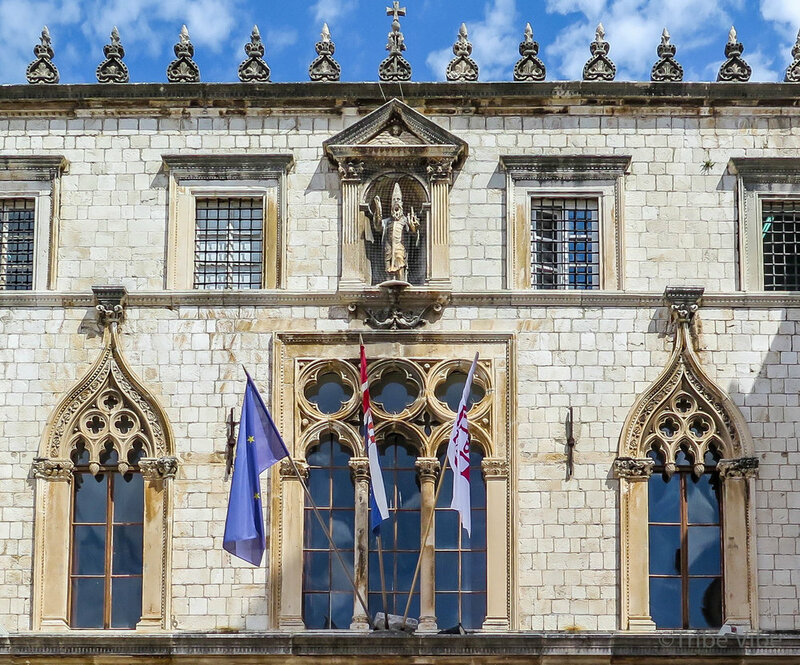 Clearly, no trip to Croatia is complete without exploring Dubrovnik and the surrounding area. 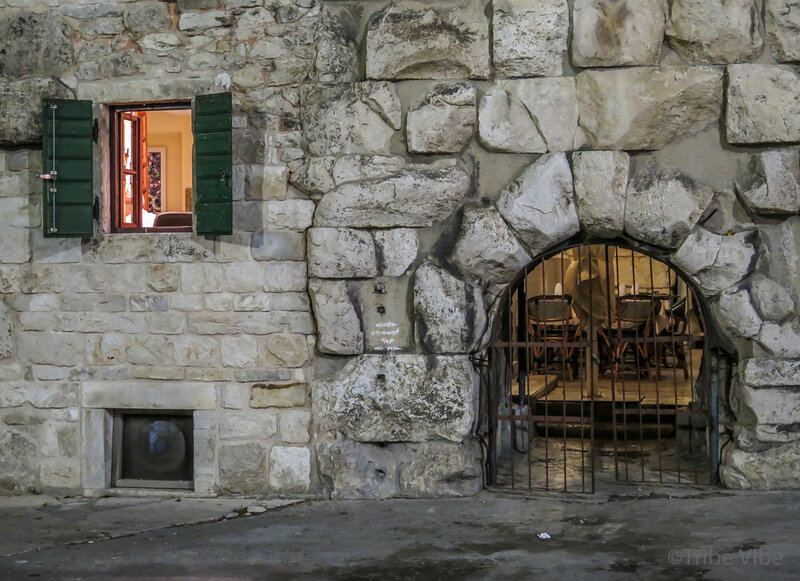 From Mlini (where we stayed), there are two ways to reach this famous walled city. One is by the highway and the other is by boat. Our first day we tried the highway, via bus. It's easy enough but its hot and you end up being dropped off a significant walk from the old town. From then on we decided the ferry was a better option. 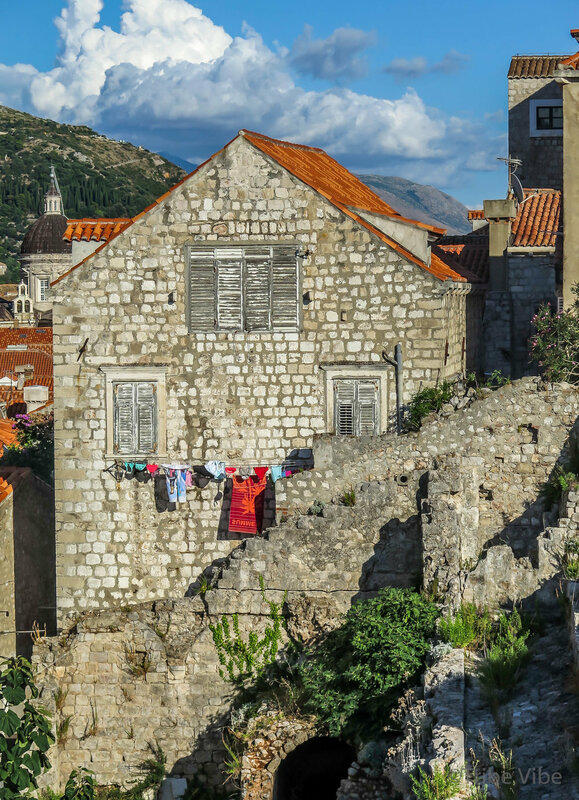 From Mlini, the ferry drops you off right at the foot of Dubrovnik's famous protective walls. 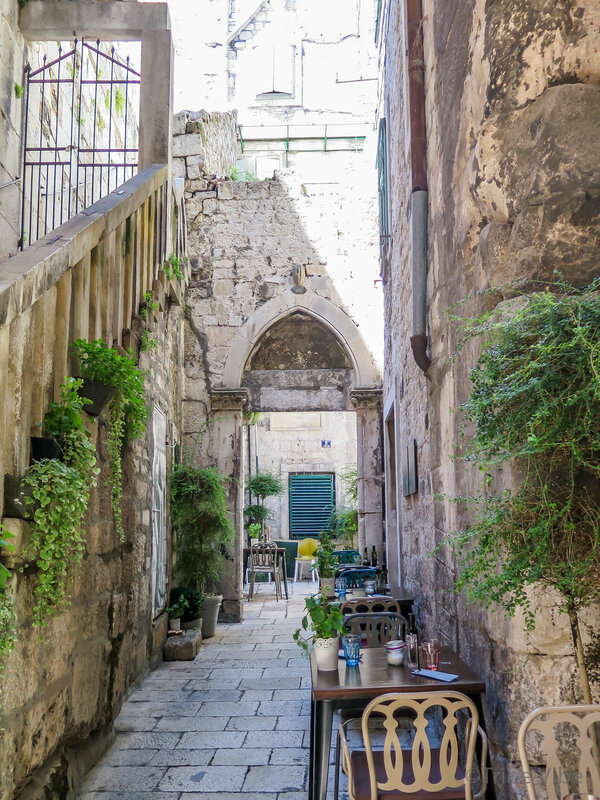 Once inside the city, the magic of Dubrovnik is everywhere. 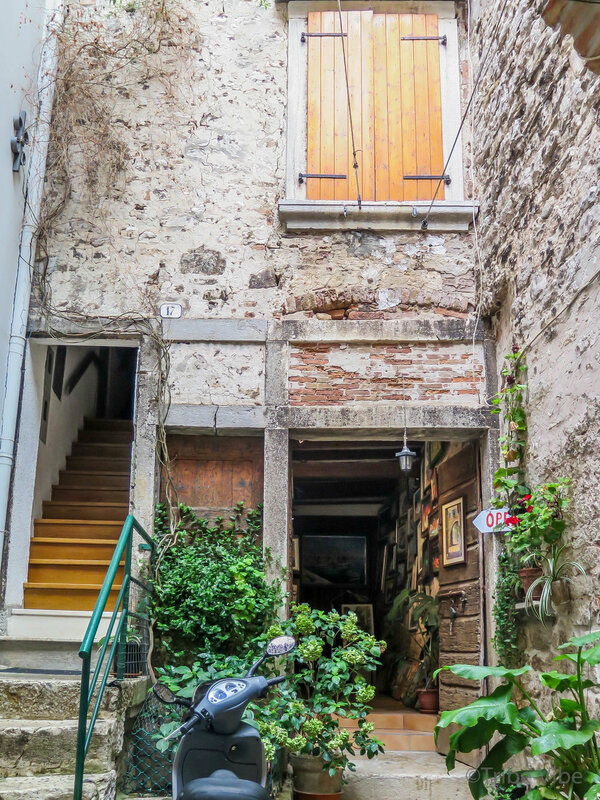 The town is filled with historic buildings, cobblestone streets, alleyway after alleyway of restaurants, shops, and homes. 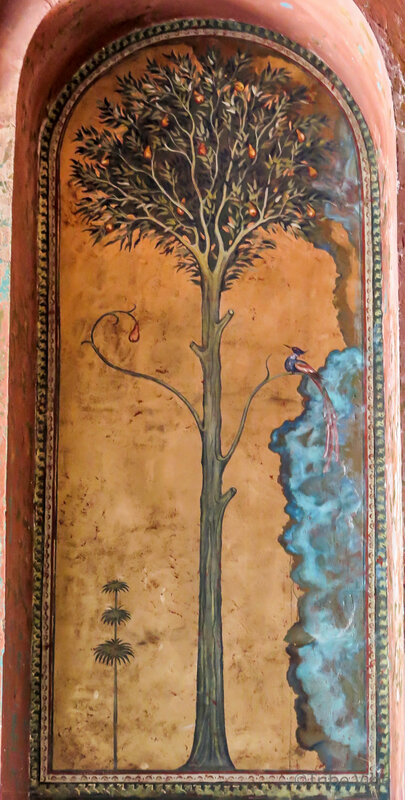 Virtually everything was beautiful! But be warned, during the day, the tourists ships come in and the town fills up very quickly. On most days we opted to come to the city in the late afternoon. That way we could benefit from the majority of tourists leaving and more importantly to capitalize on the low sun in the sky. 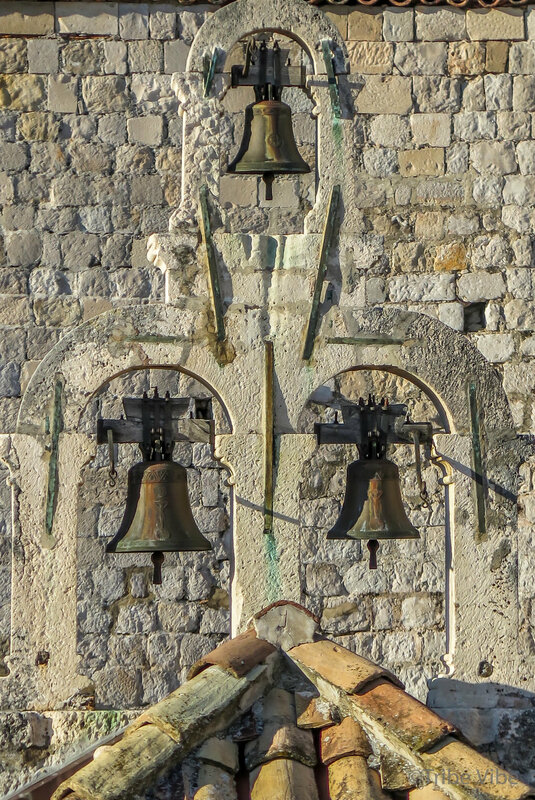 At this time of day, Dubrovnik turns completely dreamy, with the sun casting the perfect golden hues onto everything. Spectacular! Of course it almost goes without saying that the highlight was walking the city's famous walls - all 2km and 1080 stair steps. The views in all directions are amazing and highly recommended to ensure a days filled with happiness and awe. As always, I found a few windows and ornaments that caught my eye. Dancing fairies hanging across the kitchen window is sure to make anyone's day! Finding a spot to eat that will please everyone in a large group is often challenging. My sister-in-law found this great tapas bar that we all loved. I think we actually might have frequented it each day. If D'Vino's still exists, I recommend much more than a quick pit stop. Most importantly, for many in our group, was ending each and every day with a ritual ice cream stop and then the ferry back to Mlini. We left Split around midday, headed for our next destinations, Mlini and Dubrovnik. This drive was much better than the previous. In fact, it was quite spectacular most of the way passing through villages along the coast. Everything went according to plan until we reached the outskirts of Dubrovnik. Here traffic was not the problem. It was driving on roads where there was nothing between the car and a sheer drop-off down into the Adriatic. The fear of heights in our group ranged from mildly uncomfortable to complete panic. I wish I could say that that was the worst of the driving in Croatia, but no. For those who don't enjoy driving on the side of a seaside cliff, it became much worse later on. We had not originally planned on staying in Mlini. 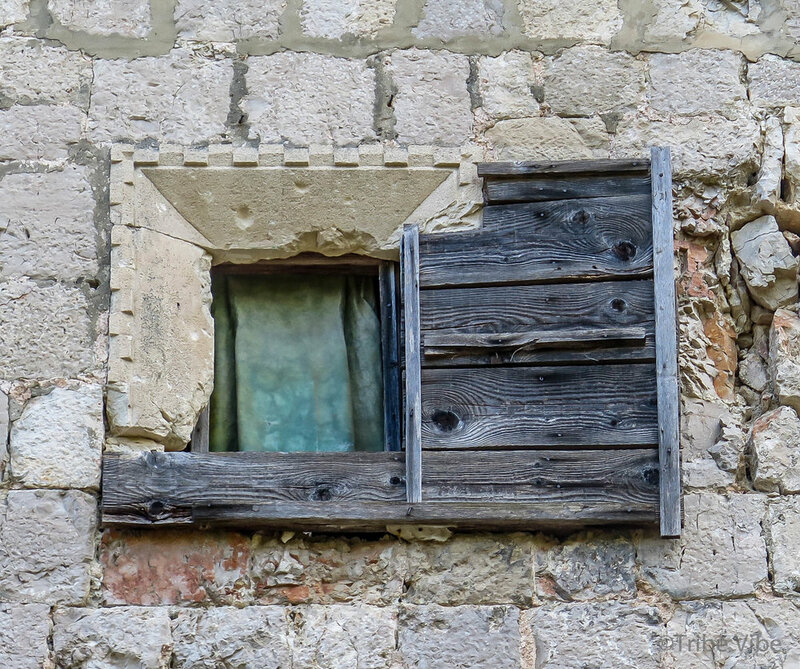 Our plan had been to stay in Dubrovnik. However, we left our planning a little too late and there wasn't a lot of rental apartment options available when we booked for such a large group. 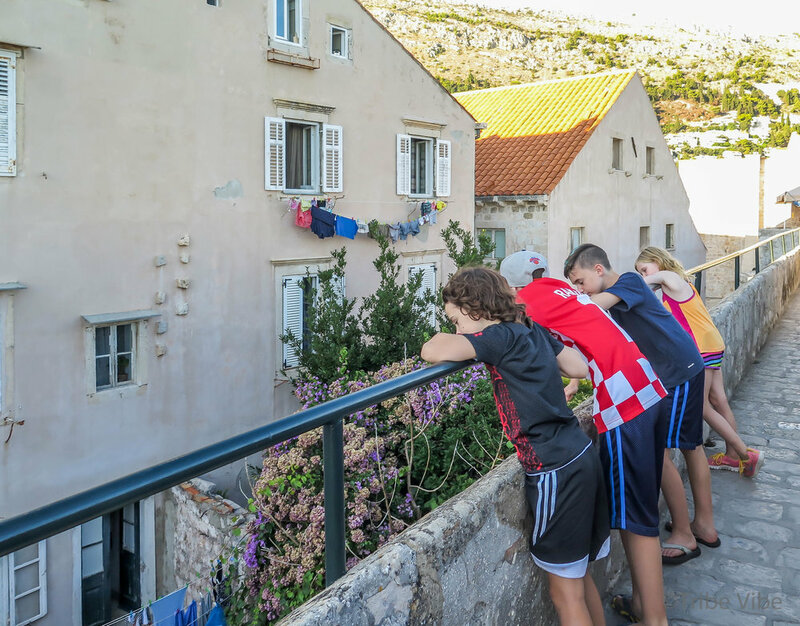 In the end, we found accommodations about 15km down the road from Dubrovnik in Mlini which turned out to be a big blessing. 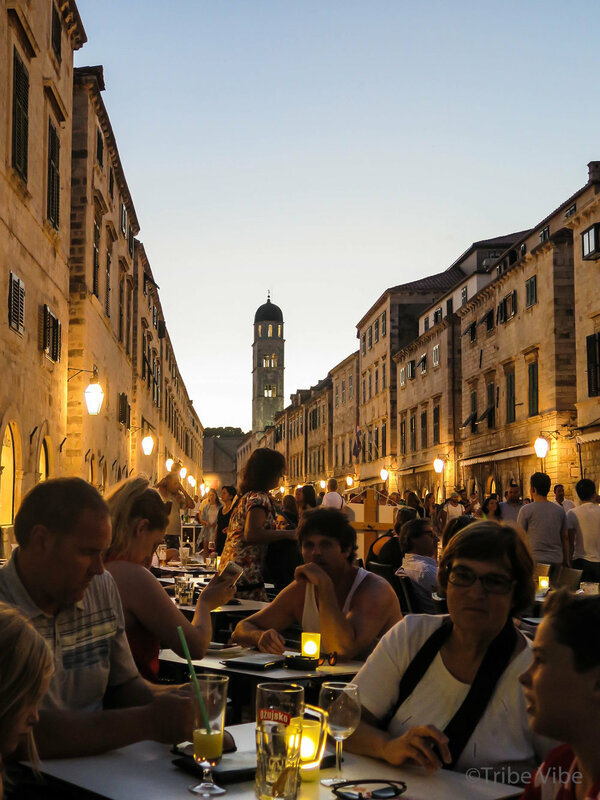 The crowds of people are pretty crazy in Dubrovnik (for good reason! ), so after a tiring day of tourism, staying in Mlini let us retreat for some rest and relaxation in this smaller port town. 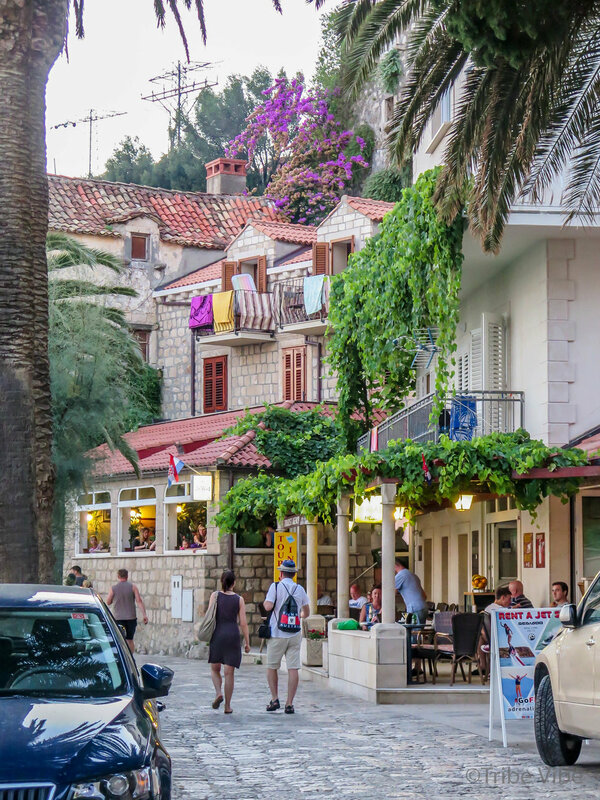 The village of Mlini is located along the Adriatic seaside. Our apartment was situated at the top of a hill overlooking the sea, so we had a good hike up and down the stairs everyday to get to the village. At the base of the stairs there was a pebble beach, boats, and a pleasant promenade with a few restaurants, marina, live music, ice cream, and a play park. It made for a great setting to end the day. One thing my kids love is trying to catch sea life in a net. Usually they are not very prosperous with their efforts, but they love to try. 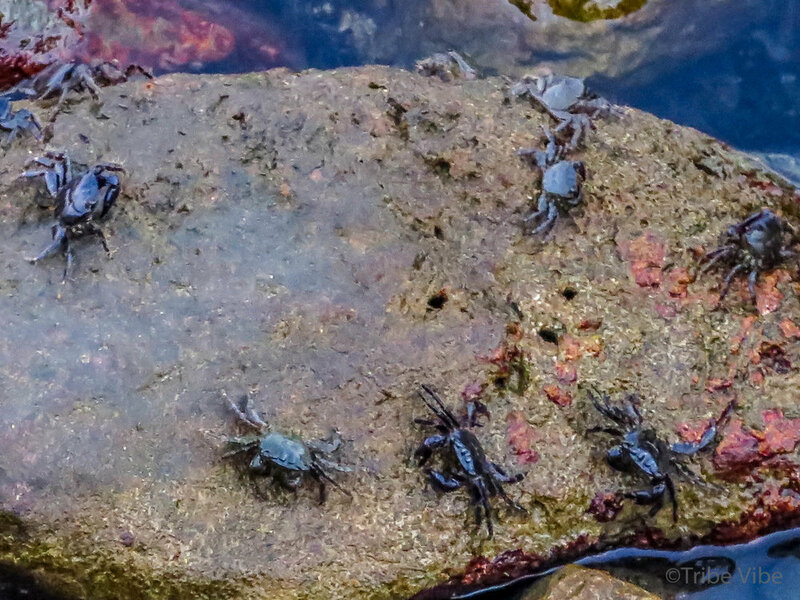 Needless to say, it didn't take long for the kids to spot the small crabs in the water along the Mlini promenade. 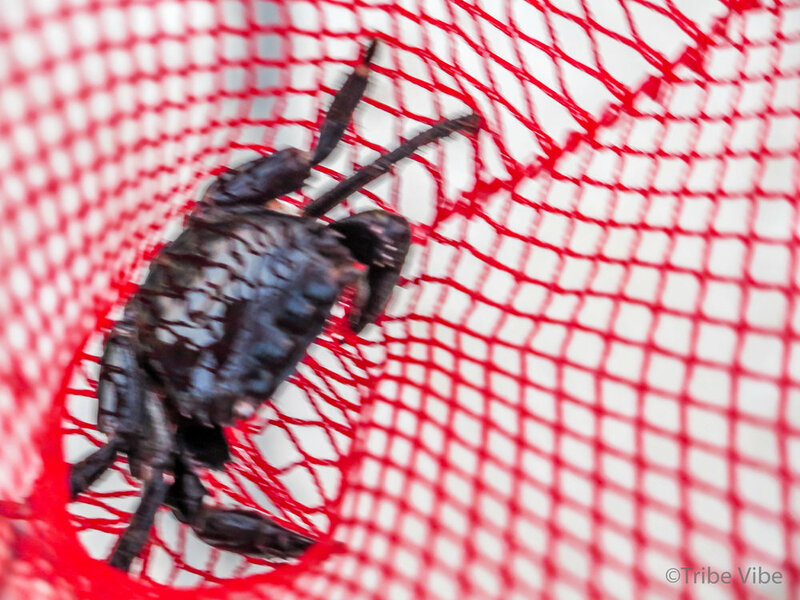 This set them on a mission to locate a net and spend hours trying to net a crab. All their efforts were not for nothing as they did manage to catch, and release, one pour soul. The kids loved it! Note: no crabs were harmed in this activity. If you are coming to Dubrovnik for more than two nights, I would absolutly recomend staying in Mlini. You can easily reach Dubrovnik by car or by ferry from this seaside port. It is a nice break at the end of a busy day sightseeing. After a long and exhausting car ride, we finally made it from Rovinj to Split. A word to the wise...never be on the road on a Saturday during the summer in Europe. Many apartment style accommodations rent on a Saturday to Saturday schedule therefore making traffic somewhat of a nightmare on these days. And when I say nightmare, I'm understating the issue. We were stuck so deep in traffic numerous times. More than once, both kids and parents were hungry with full bladders ready to burst and few options in sight other than the foliage on the side of the road. The grandparents were the only ones holding it all together. 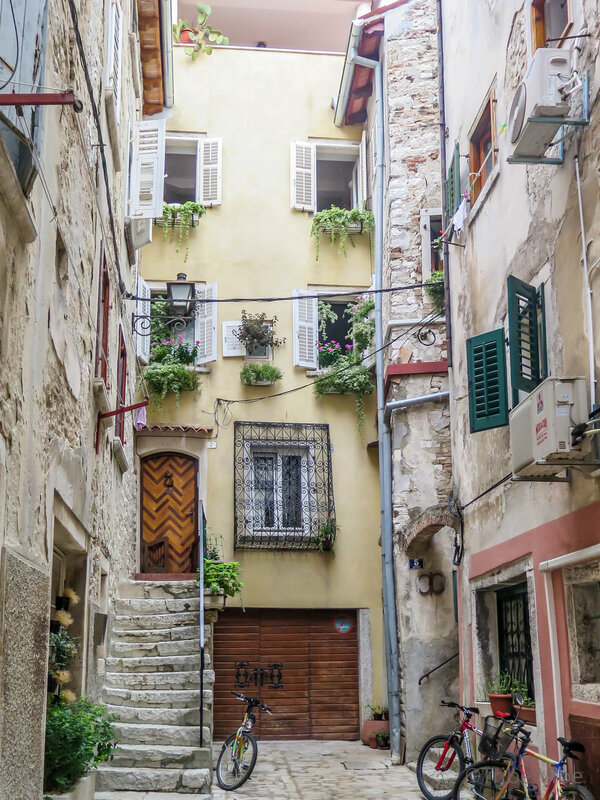 To make matters a worse, we got lost just outside the old town walls of Split where the cars were jammed in so tight that moving the smallest of cars around would have been difficult especially for those of us who learned how to drive in spacious North America. At the time, we were driving a nine seater mini van. Good times - not! And trying to park said minivan was a colossal pain. 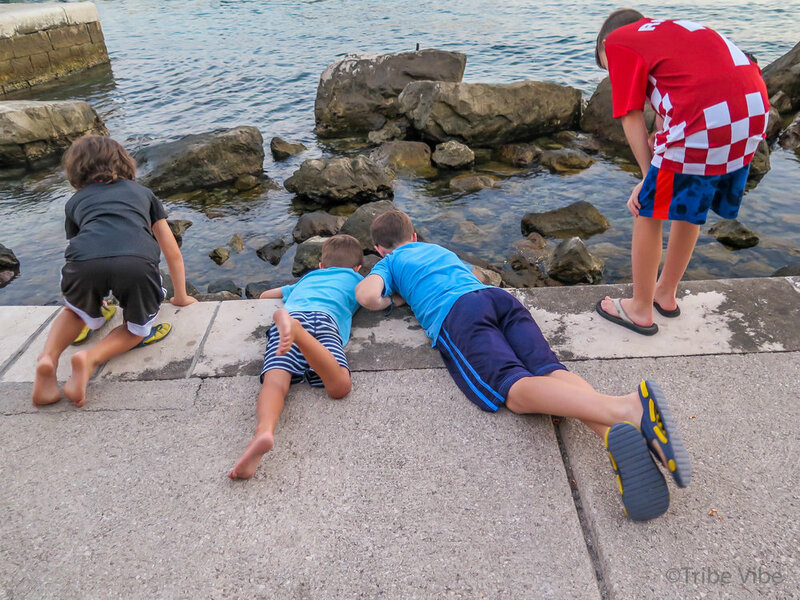 Hours after our unexpected and unwanted car tour of Split, we were finally out of the car and heading to the promenade along the sea. 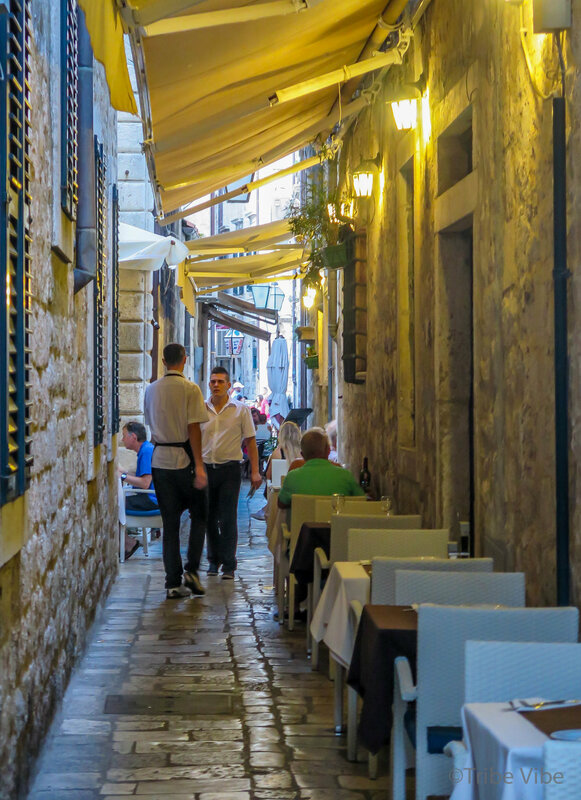 It didn't take long to realize that Split was a major hub for anyone visiting Croatia by land or by sea. There were people, cars, more people, and boats everywhere. This place was packed. 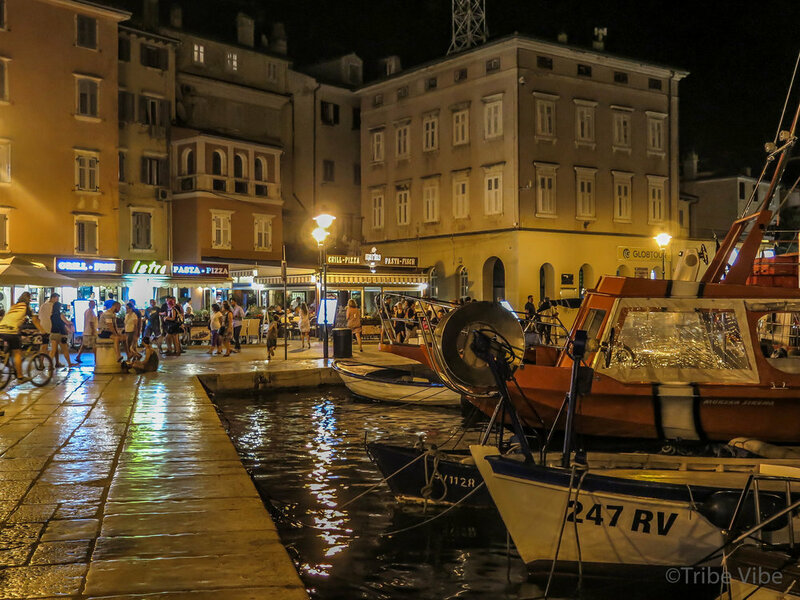 The harbour was lined with cruise ships and large sailboats, some with people on them and others empty as their passengers had come to Split to enjoy a lively evening. 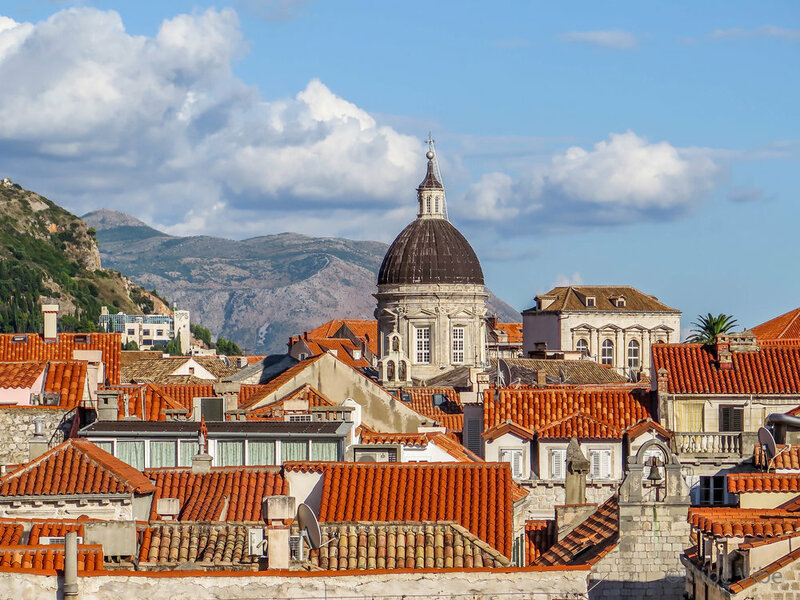 Clearly, Split is an active seaside city with a buzz. The promenade along the sea was full of restaurants overflowing with customers, souveniour stalls, and tasty snacks. 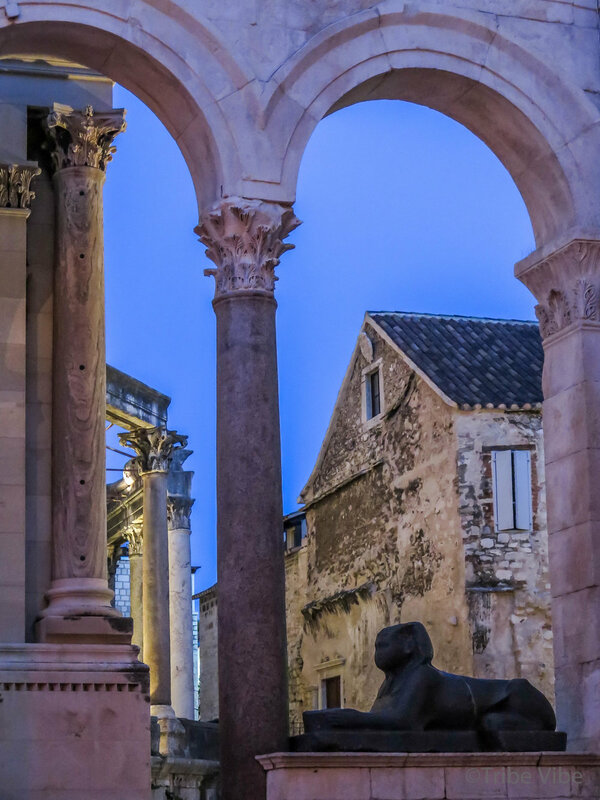 The main tourist site in Split is The Diocletian Palace located behind the seafront promenade. A maze of small, narrow streets wound their way around the ruins of the Palace. Small shops dotted the streets selling everything imaginable. What is left of the palace is impressive in size and beauty. It makes an even bigger impact when visiting it at night. 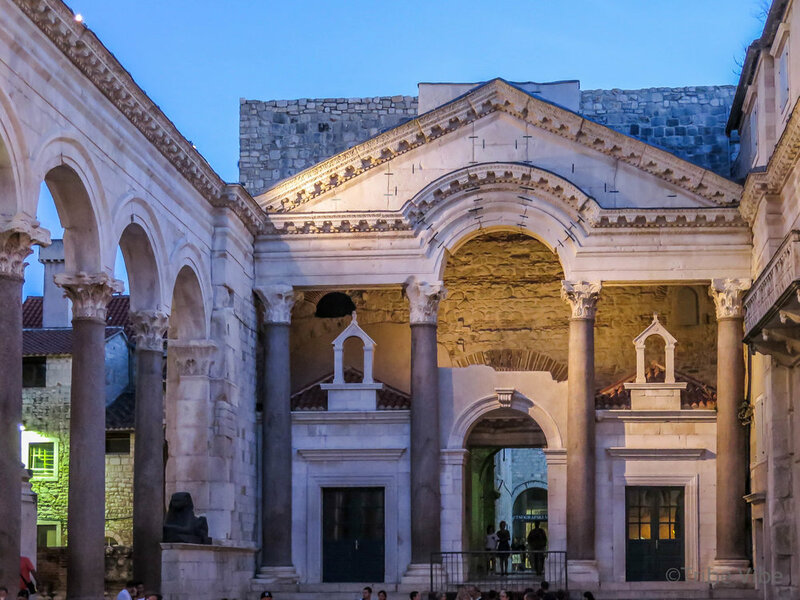 Happily we encountered a live band in the courtyard of The Diocletian Palace which made for a perfect and memorable way to spend the late evening. As always, there were plenty of windows to fascinate me. The Wisteria growing everywhere was magnificent. 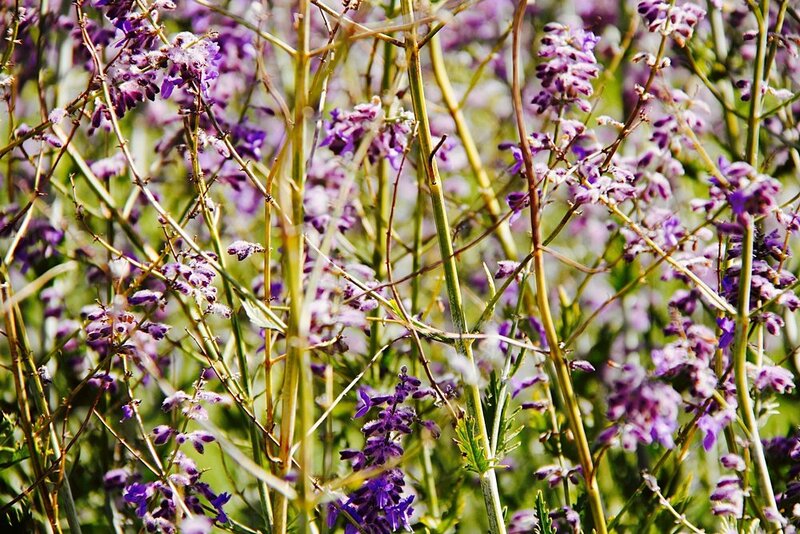 Huge, lush, purple flowers draping down in bunches from the stone buildings. 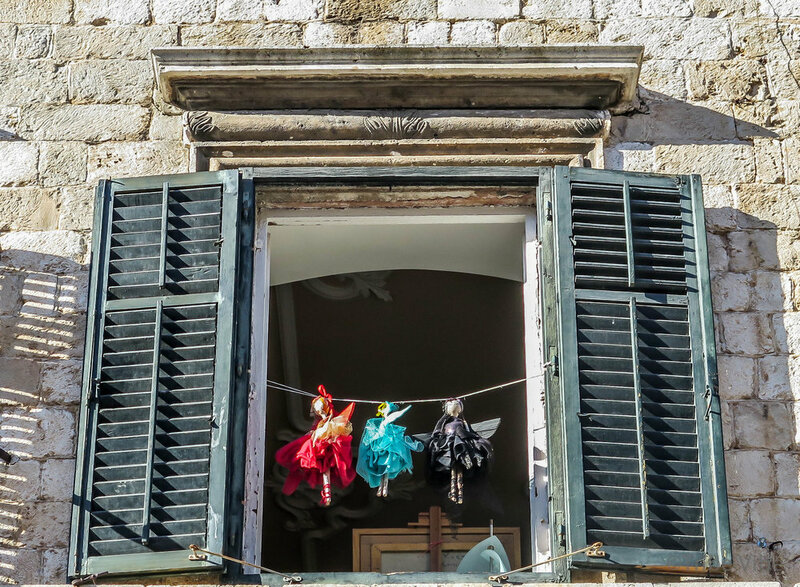 Laundry also hung freely from the stone walls making everything feel very whimsical. Outside the stone walls was a small play park and fountain. Of course, the kids spotted it immediately and we ended up spending an enjoyable few hours here. 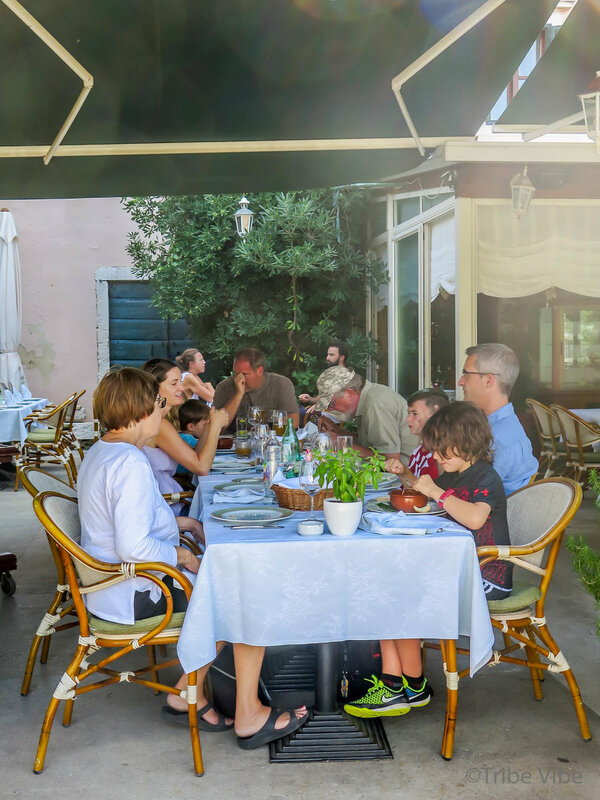 The adults sipped coffee while the kids played - a perfect end to our stop in Split. Over the last month I have been helping a few friends plan their trip to Croatia. 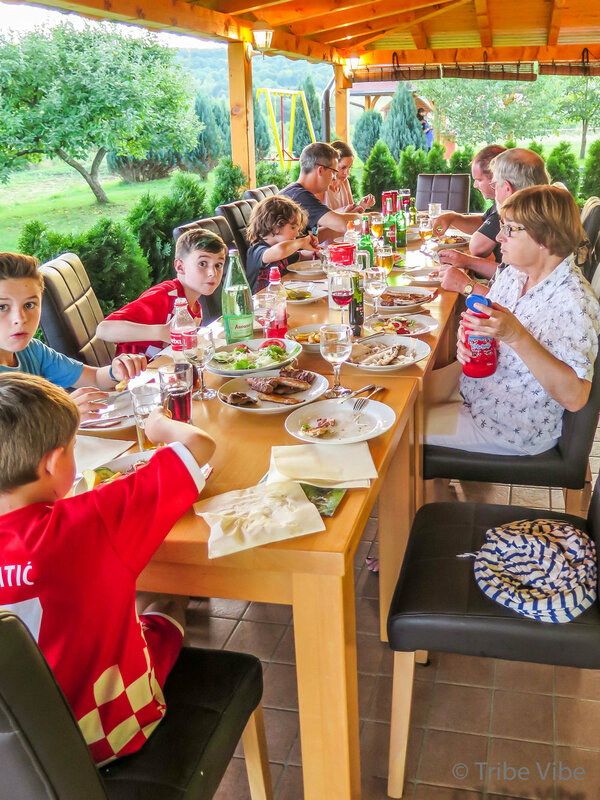 Instead of telling the same story over and over again, I thought I would take time to share our Croatian journey here on Tribe Vibe. 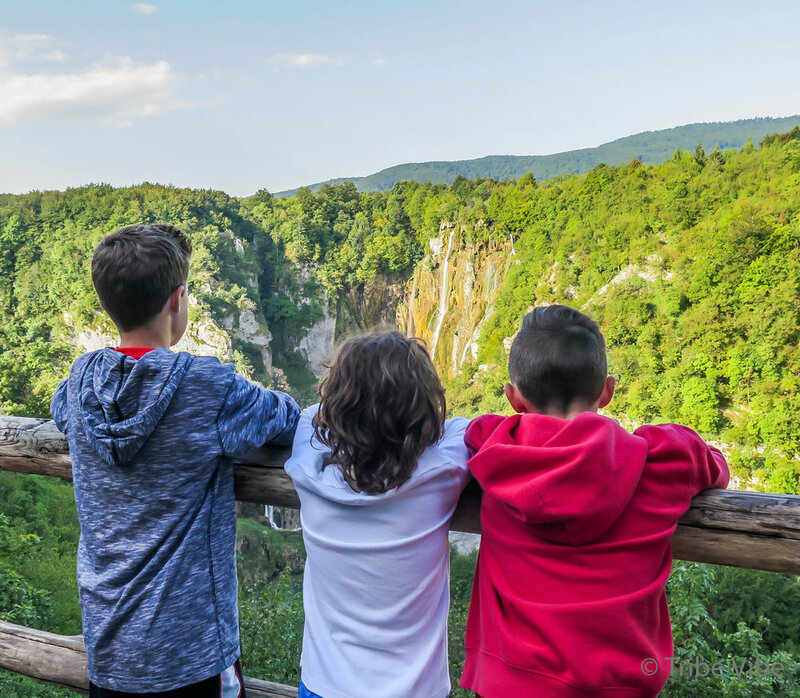 We were looking for a summer holiday that would suit the needs of children ages 4, 6, 7, 9, and 11 years old, 4 parents, and 2 grandparents. Croatia came to mind almost immediately - for good reason. 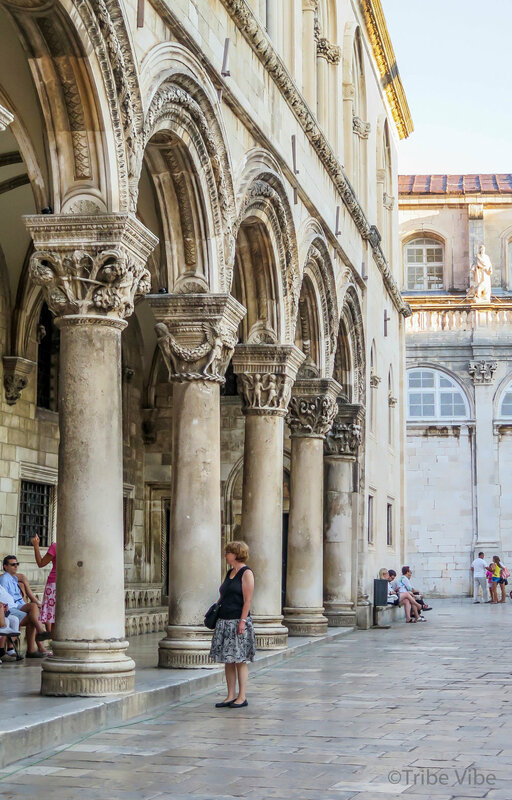 It checks many of boxes related to a perfect vacation - beautiful sea front, green national parks, interesting history, old town European charm, nice people, enchanting islands, delicious food and wine, and (of course) the gorgeous walls of Dubrovnik. 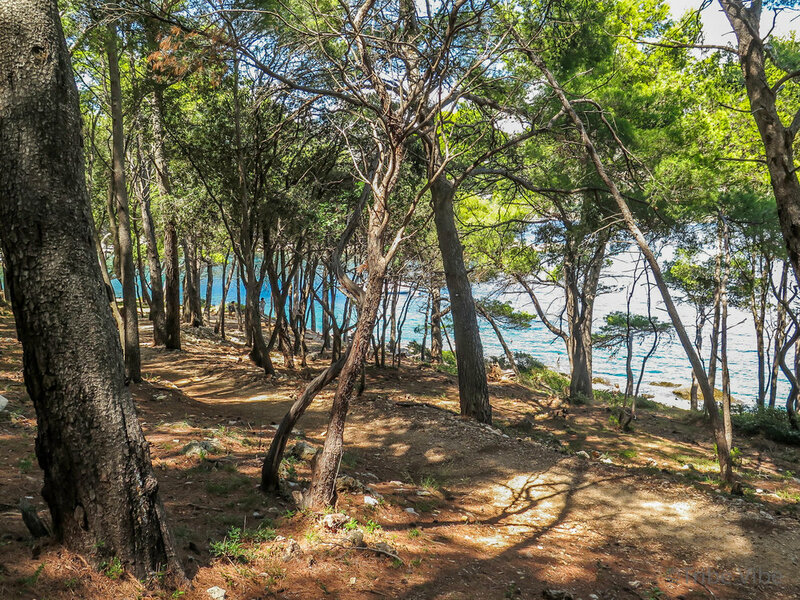 There are two main ways to explore Croatia - either by land in a car or by sea. We, of course, opted for the road version given my aversion to boats of any kind. 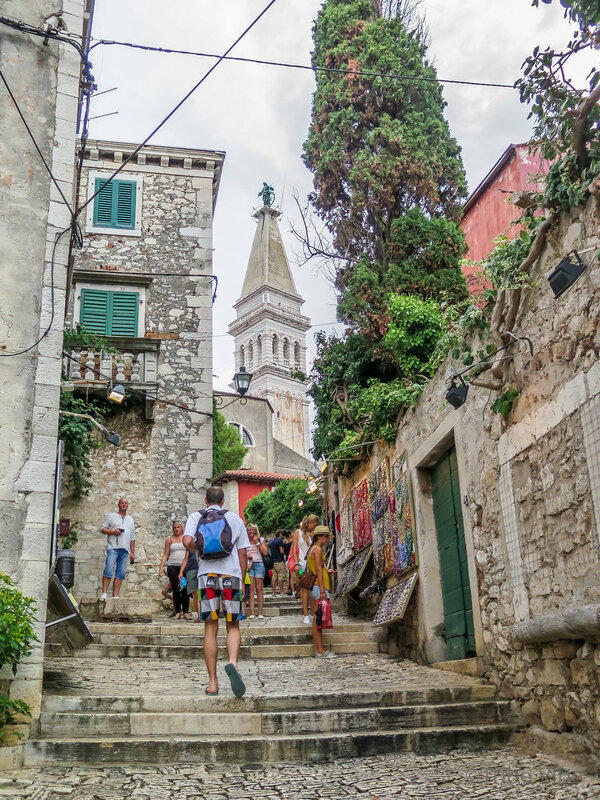 Our route included stops in Rovinj, Split, Mlini, Dubrovnik, Ston and Mali Ston, and Plitvice Lakes. 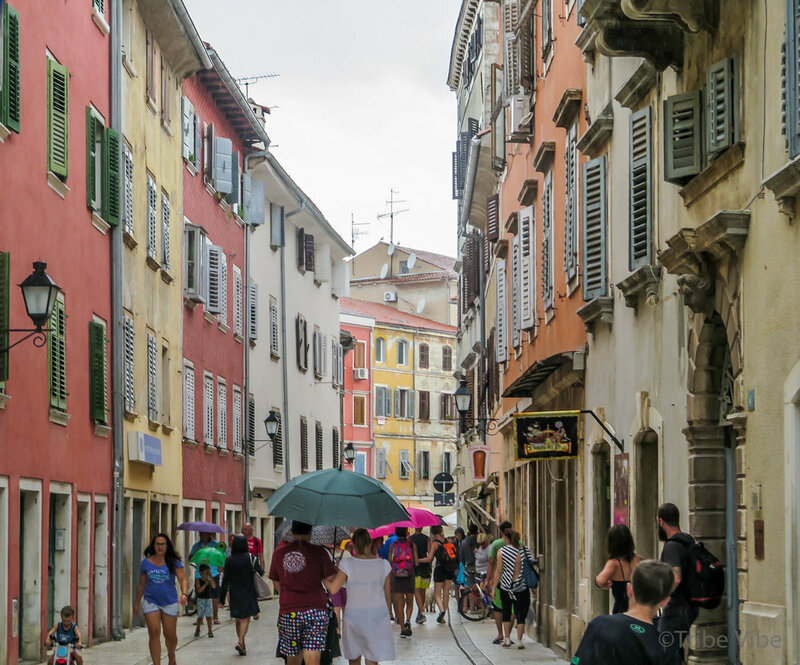 The old town of Rovinj, is a fantastic maze of old European charm. 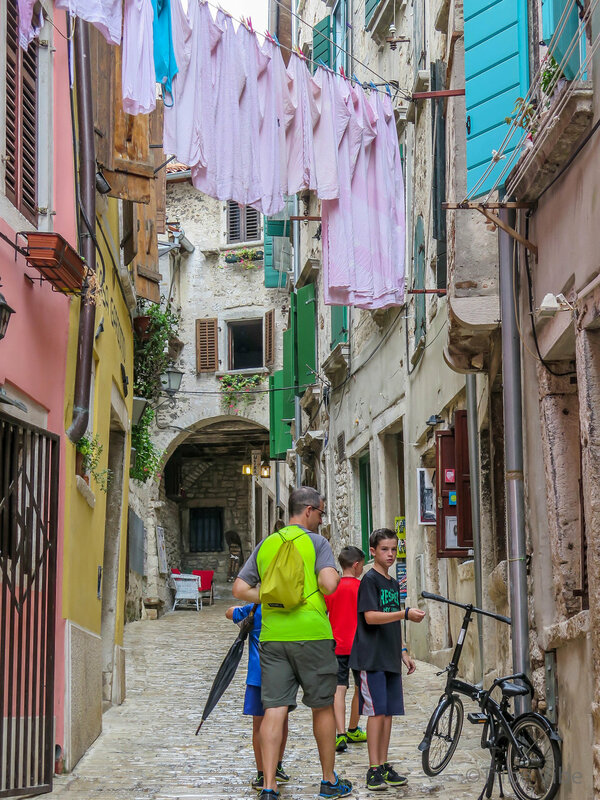 Street after street of cobblestones, crumbling stonework, and fresh hanging laundry. It doesn't get more European than this! 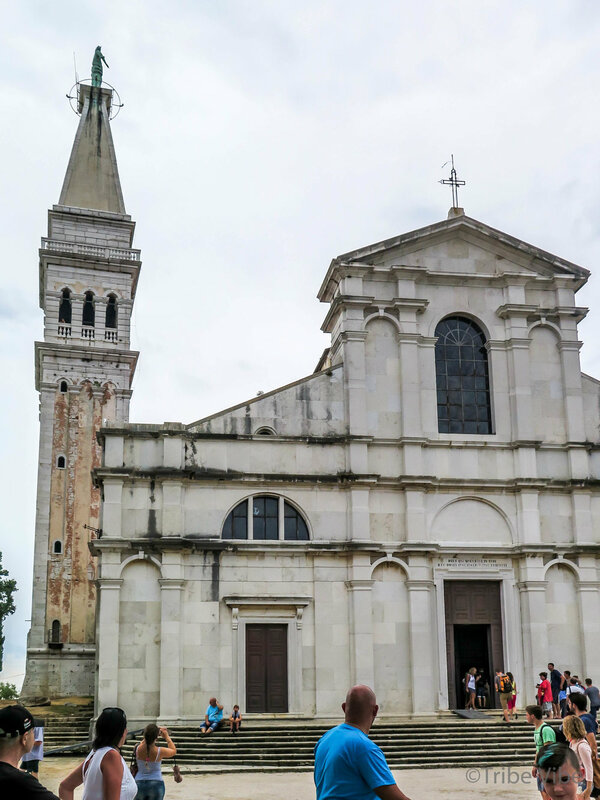 The highlight of the old town is the climb up the streets to the Church of St. Euphemia. 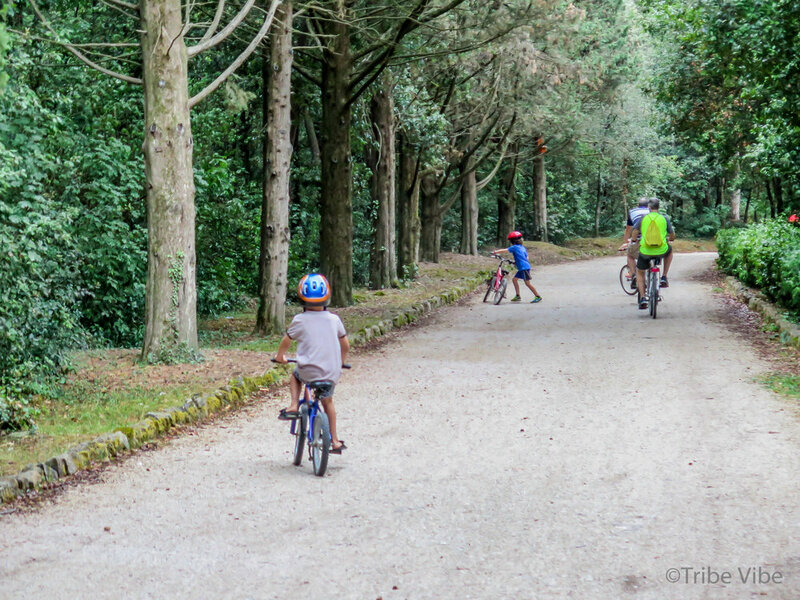 We also filled our time riding bikes along the Adriatic coast. The kids loved it! 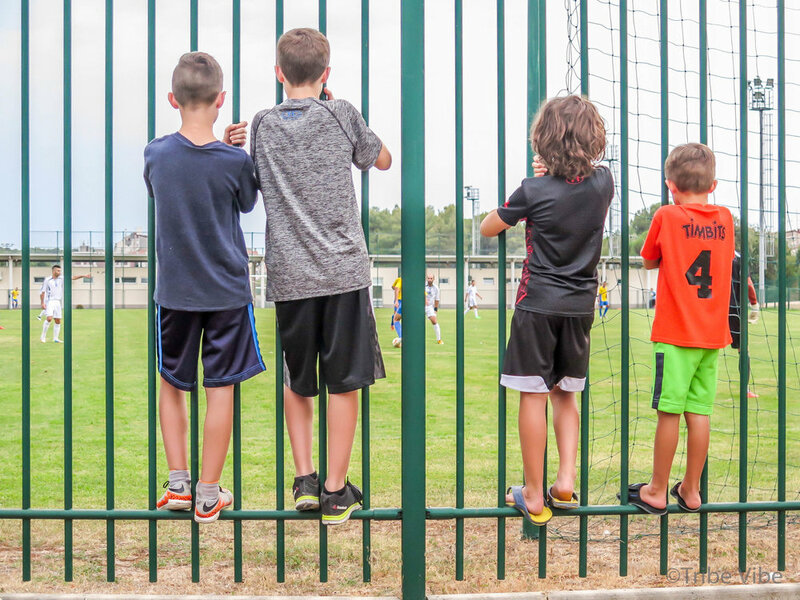 For them, it was one of the highlights of the whole trip to Croatia. We rode down the paths, played on the rocks beside the sea, and repeated many times! Plus, with five kids in tow, we were always on the lookout for wildlife along the way. Another highlight for the kids. In the evening, the port comes to life with restaurants, street performers, and people out enjoying the evening with friends and family. A stroll along the boardwalk looking at boats and eating ice cream is the perfect end to any day. 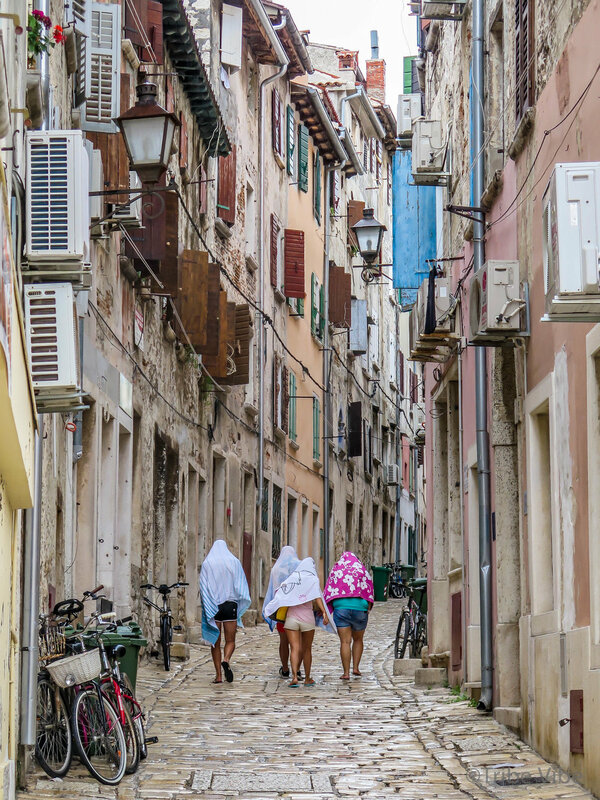 All together, Rovinj was one of our favourite stops in Croatia. If you have a chance, don't miss it. Next stop, Split.